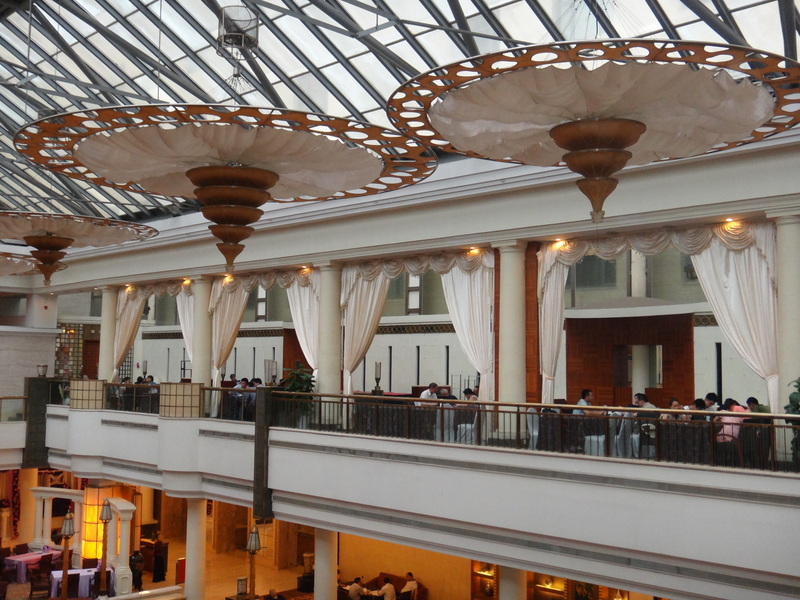 Exquisite architectural design inside the Jin Jiang Hotel. 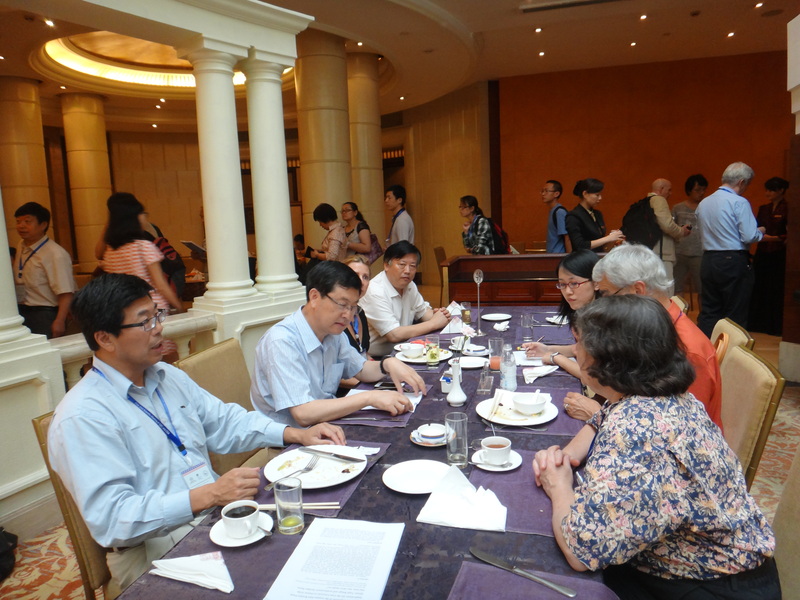 The recently concluded First Joint Scientific Meeting of Geological Society of China (GSC) and Geological Society of America (GSA) proceeded efficiently in the modern setting of the Jinjiang Hotel, Chengdu, Sichuan Province, China. GSA’s International Section played a key role bringing this meeting to the overseas communities. The meeting, titled ‘Roof of the World’, ended on 19 June, 2013, followed by several field trips that lasted from three to six days. The meeting was designed to promote and bolster the academic communication between the GSC and GSA, and covered a wide range of topics presented through 15 technical sessions, including: Evolution of the Qinghai-Tibet Plateau, Continental Deformation and Deep Lithosphere Processes, Intra-Continental Deformations and Geo-hazards, Accretionary Orogens, Deep Earth Processes through Geochemistry, Mineral Deposits, Basins and Petroleum Resources, Permian-Triassic Mass Extinctions, Ultra High-pressure Metamorphism, Ophiolites, Carbon Sequestration, Water Resources and Hydrogeology, Gas Hydrates, Critical Transitions in Earth’s History and Foreland basin tectonics. The GSC-GSA meeting took place just about six weeks after an earthquake struck Sichuan Province; however the City of Chengdu largely remained unhurt. Based on presented talks and posters as shown in Figure 1, the session titled Mineral Deposits: Genesis and Exploration ended up having the highest number of presenters, and it certainly demonstrated China’s recent focus on resource geology in order to meet the demand for increased supply of energy and industrial minerals in connection with rapid urbanization and manufacturing needs. Scientific sessions on Tectonic evolution of the Qinghai-Tibet Plateau and Intra-Continental Deformation, Gas Hydrates, and Foreland Basin Tectonics also drew the attention of many participants and reinforced the need for conducting additional fundamental research. Environmental sessions, including Carbon Sequestration and Water Resources and Hydrology, were popular and reminded us again about the need to maintain a sustainable environment and ecological balance given the rapid expansion of overall infrastructure and trade. Chengdu is the capital city of Sichuan province, and is currently recognized by many as the focal point of science and technology, finance, trade and commerce in southwestern China. It is the regional hub for communication and transportation. Chengdu’s 14 million inhabitants have a noticeably high proportion of science and technology skills, and the city is home to a large number of international financial institutions. Chengdu ranked fourth out of all Chinese cities in terms of permanent resident population after Chongqing (28.8462 million), Shanghai (23.0191 million), and Beijing (19.6120 million). Chengdu is the flagship city for foreign investment in China. As a city famous for its tourism and its historical culture, Chengdu boasts Three-Kingdom-Period Culture, Jinsha Relics, the Dujiangyan Irrigation System (over 2000 years old), and other historical sites. Given its booming economy, tourism, and recent high-tech establishments, Chengdu was honored the “Best Tourism City of China” by the World Tourism Organization and the National Tourism Administration in 2006. The city of Chengdu is situated in the southeastern portion of the Chengdu Plain, with high relief to the west and low to the east, a typical inland area. Tectonic units of Chengdu include the Mt. 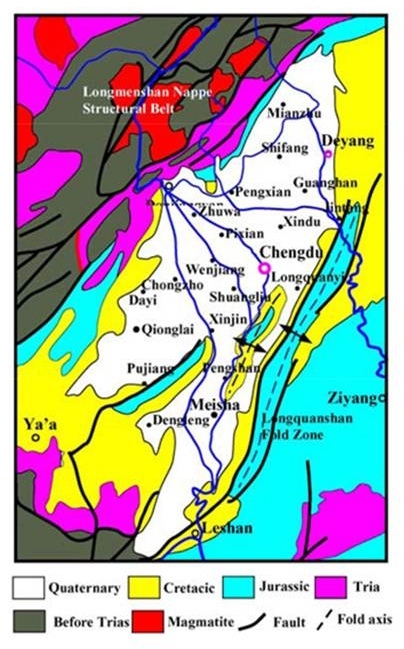 Longquan thrust belt, Chengdu Depression and Longmenshan Fold. For the most part, the Chengdu plain has an elevation ranging from 450 to 720 meters. Chengdu is bordered by the high and steep Longmen Mountain in the northeast and by the Qionglai Mountains in the west. Miao Jiling (5,364 m or 17,598 ft) and Xiling Snow Mountain (5,164 m or 16, 942 ft) are the loftiest mountain ranges. The western mountainous area is also home to a large primitive forest with abundant biological resources and a Giant Panda habitat. East of Chengdu stands the low Longquan Mountain and the area bordering to the west is comprised of the hilly middle reaches of the Min River. Since ancient times, Chengdu has been known as owing to its fertile soil, favorable climate, and novel Dujiangyan Irrigation System. The surficial geology of Chengdu adjacent to the meeting place is divided into three stratigraphic units: the upper 1-3 m surface layer is occupied by yellow-gray silt clay and fill, the middle is brown- yellow gravels 10 to 20 meters thick with silt clay and silt lenses with sporadic clayey units, and the bottom is composed of red, thick-bedded mudstones of the Cretaceous Guankou Group (Figure 4 through Figure 6; after R. Q. HUANG, S. J. WANG, Z. M. XU, & L. Z. WU 2006). 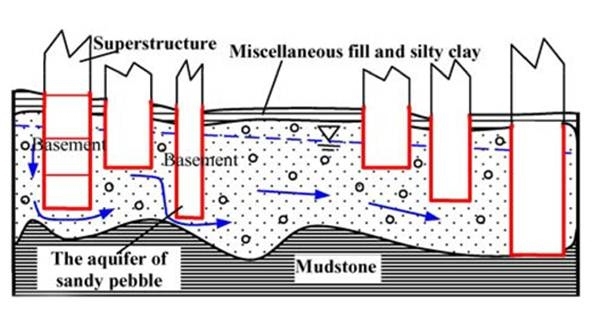 Due to high bearing capacity of the gravels (allowable bearing pressure is commonly from 700 to 1200 kPa) in Chengdu, it is deemed to be sound from a geoengineering point of view and capable of supporting most buildings (R. Q. HUANG, S. J. WANG, Z. M. XU, & L. Z. WU 2006; IAEG Paper number 712). The weather was hot and humid and early morning showers kept humidity at a high level for both Tuesday and Wednesday (June 18 and 19, 2013). The conference venue was comfortably located in a downtown setting with lots of eateries (including Starbucks) within walking distance. The nearby Funan River walk was a pleasant break for many participants after the meeting, and it was quite peaceful. Lots of local residents were enjoying the scenery and doing physical activities: dancing, meditation, and other forms of aerobic exercises even close to midnight. Many residents easily get around the city on scooters. It was quite interesting to see several dozen scooter riders waiting patiently for traffic light turning green. Everyone followed their designated path with no apparent conflict with pedestrians! An easy way to get around in Chengdu is to ride scooters! The Geological Society of China was founded in Beijing on 27 January 1922. It is one of the earliest scientific organizations in China, whose predecessor was the Chinese Society of Earth Sciences formed in Tianjin in 1909. The earliest geological map ever produced in China (that of the former Zhili Province, covering the present Hebei Province, Beijing, and Tianjin) was published in the founding issue of the Journal of the Chinese Society of Earth Sciences in 1910. Currently GSC has well-over 80,000 members. Apart from the GSC, the International Professionals for the Advancement of Chinese Earth Sciences (IPACES) coordinates with other geological agencies in China. The IPACES is a nonprofit organization established in 1999 and registered in the State of Michigan, USA. The missions of the IPACES are a) to promote cooperation in earth sciences between China and the US, and between China and other countries, and b) to advance earth science research and education in China. Preparation for a joint GSC-GSA meeting dates back to 2011 when GSC and GSA representatives signed a memorandum of understanding (MOU) at the GSA Annual Meeting held in Minneapolis, MN. Dr. Paul Robinson, past Chair of the GSA International Section (IS), suggested Roof of the World as the title for this meeting and his suggestion was agreed upon by all attending IS management board members and guests. Details about this MOU were communicated through GSA IS 2011 Newsletter. Dr. Jack Hess (GSA Executive Director) and Melissa Cummiskey (GSA Director of Meetings) visited Chengdu in May of 2012, met their Chinese counterparts, and ironed out several key issues associated with the meeting, including the meeting location, accommodations, and other logistical matters. Through the subsequent involvement and well-coordinated hard work of several key personnel, including Dr. Juhn Liou, Dr. I-Ming Chou, Professor Shuwen Dong (Chinese Academy of Geological Sciences), Dr. An Yin and Dr. Nazrul Khandaker, the Roof of the World meeting took shape and enabled participants from various parts of the world to attend and present their research. The fourth and final circular came into being in May of 2013 and culminated by assembling over 424 registrants including 97 overseas participants. Among the overseas participants, 66 were from the United States and the rest were from other 12 countries. There were over 329 abstracts presented (141 oral and 188 poster) at this first joint meeting between the GSC and GSA; however 531 abstracts were published in Acta Geologica Sinica, volume 87, Supplemental Issue 2013. GSA was represented by Suzanne Kay (incoming GSA President), Jack Hess (GSA Executive Director), and Wesley Hill (GSA International Secretariat), and GSA’s International Section Management Board (ISMB) was represented by An Yin (UCLA), Nazrul Khandaker (CUNY), and Ric Terman (GSA IS Treasurer and retired USGS geologist). As part of the bilateral agreement between the GSA and GSC, a reciprocal meeting will take place in 2015 prior to the GSA Annual Meeting and Chinese geologists will resume their US journey by attending a pre-meeting field trip starting from the western cordillera and culminating on the east coast. Tentative trip leader for this conference will be Dr. An Yin (UCLA and current GSA IS Chair). There were two separate tours to the Giant Panda Breeding Station and Wenchuan Earthquake Site, and these pre-meeting trips were completely sold out. I attended the tour to the Giant Panda Breeding Station and was amazed to see both traditional black and white as well as red pandas and learned about their unique sedentary lifestyle. Pandas live 25-30 years and bamboo, panda’s main food, seem to control their growth. Once bamboo flowers blossom (usually happens on a 75-85 year cycle), pandas go hungry because a scarcity of food becomes eminent. Post-meeting field trips included visits to the Permian-Triassic boundary beds and Early Permian-Middle Triassic marine successions of the northern margin of the upper Yangtze Platform (June 20-23), as well as to the Sanjiang Orogenic Belt in Yunnan Province (Kumming-Dali-Baoshan-Tengchong-Kumming; June 20-26). On the evening of Sunday June 16, an ice breaker and welcoming reception was organized by the local host with welcoming speeches from Mr. Xianlai Meng (Executive Vice President of the Geological Society of China), Dr. Jack Hess (Executive Director, GSA), Professor Shuwen Dong, and Dr. Suzanne Kay (incoming GSA President). Wang Min, Vice Minister of the Ministry of Land and Resources and Head of China Geological Survey, attended the meeting and gave a speech at the opening ceremony. Wang Xiaolie, Deputy Director of China Academy of Geological Sciences, Zhu Lixin, Secretary General of GSC, and Clark Burchfiel were present at the meeting together with over 424 geologists from China and America as well as from other countries. Dr. Suzanne Kay reflected on US-China geological collaboration and mentioned Amadeus W. Grabau as the earliest documented US geologist working in China as early as 1925 who published a benchmark paper titled “Fundamental concepts in geology and their bearing on Chinese stratigraphy (Bulletin of the Chinese Geological Society, Volume 16, Issue 1, p. 127-176, 1937). 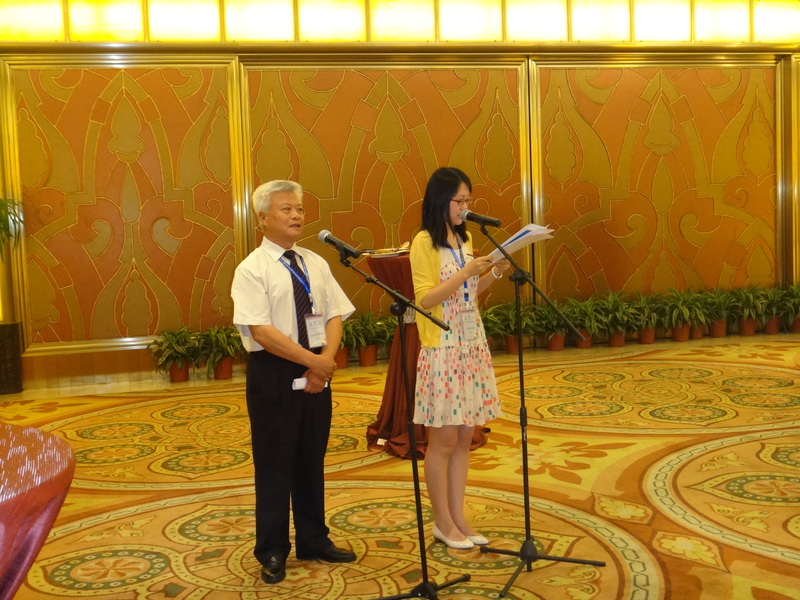 GSC Executive Vice President Xianlai Meng gives a welcoming speech along with his interpreter. In his speech, Mr. Wang Min said that since the founding of GSA 125 years ago, American geologists have been making remarkable contributions to the development of the geosciences. Likewise, GSC has gone through a history of 91 years. With the sustained and rapid development of China’s economy, China has been making a series of new geoscience achievements, developing toward the new realms of deep space, deep seas and deep ground. Worldwide geological research subjects such as continental tectonic and dynamics and Qinghai-Tibetan Plateau have been attracting more and more geologists. GSA Executive Director Jack Hess gives a welcoming speech. In their welcoming speeches, Ms. Suzanne Kay and Mr. Jack Hess reviewed the origin and history of the cooperation between GSA and GSC as well as the results achieved by both sides in the fields of environmental geology and geo-hazard prevention, hoping that the cooperation and communication will successfully continue. It was followed by buffet-style dinner with incredible assortment of scrumptious food, wine, and soft drinks. Chinese delegates led by Professor Shuwen Dong and Mr. Xianlai Meng spent virtually all of their time coordinating this meeting, attending various theme sessions and were highly visible from dawn to dusk. Along with other attending Chinese participants, they exhibited lots of exuberance, excitement, and dedication to this conference and made sure the meeting was meaningful and exemplary to the participants from both scientific and logistical points of view. Student volunteers, mostly undergraduates from the Chengdu University of Technology (CDUT) were directly involved in various operational phases associated with this meeting and their punctuality, work ethics, and amiable disposition greatly impressed meeting participants. 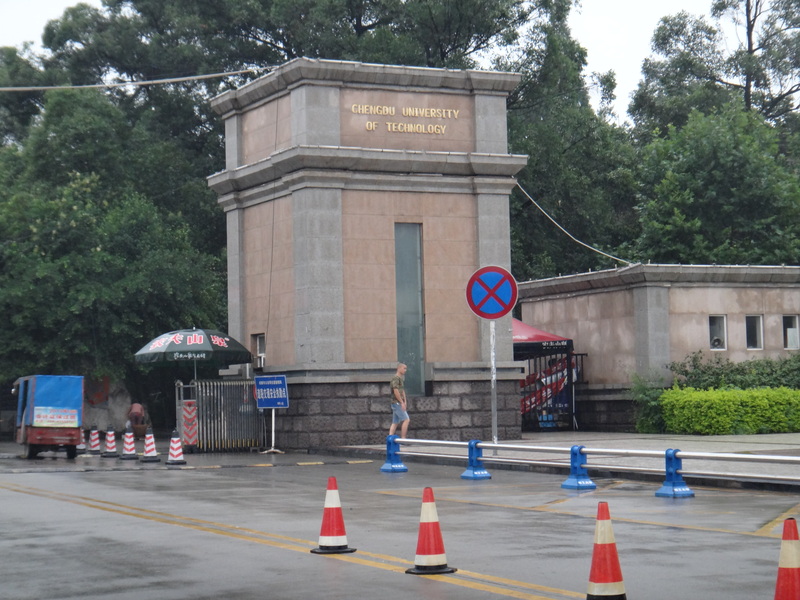 Once CDUT established in 1956 was previously called as Chengdu College of Geology until 1993. Dr. Shuwen Dong (CAGS) supervising registration matters with Chengdu University of Technology (CDUT) student volunteers. 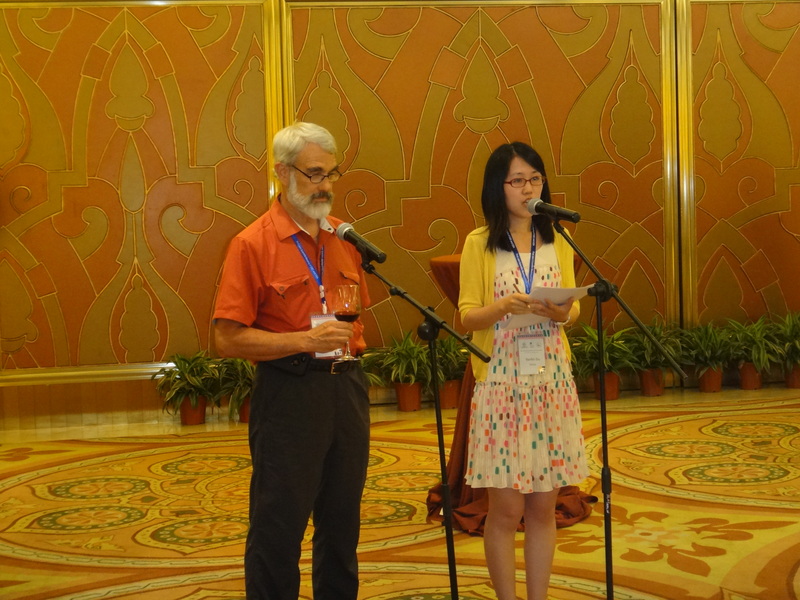 Plenary sessions were co-chaired by Dr. Jingsui Yang (State Key Laboratory for Continental Tectonics and Dynamics, Institute of Geology, Chinese Academy of Geological Sciences (GSC) and Dr. An Yin (GSA International Section Chair). The invited papers at the meeting were excellent and certainly updated our understanding of the tectonic history of western China. MIT Professor Clark Burchfiel, keynote speaker and also the GSA International Section’s recipient of 2013 Distinguished Career Award, enlightened everyone with his outstanding presentation titled “Tibetan Plateau: Progress, but many first order questions remain”. Dr. Burchfiel gave a chronological account of how our ideas have been refined as additional multidisciplinary information became available through the years. Burchfiel is now retired from MIT, but still actively conducts research and continuously adds to his understanding of Himalayan Tectonics spanning over half a century! Dr. Clark Burchfiel delivers his keynote address. Professor Shuwen Dong (Chinese Academy of Geological Sciences-CAGS, China), Dr. Runqiu Huang (Chengdu University of Technology), and Dr. Mark Harrison (University of California) spoke about the SinoProbe Project, A story from the Wenchuan Earthquake in Sichuan Province, and 4.4 billion years of shared crustal evolution, respectively, bringing different perspectives to the meeting participants. 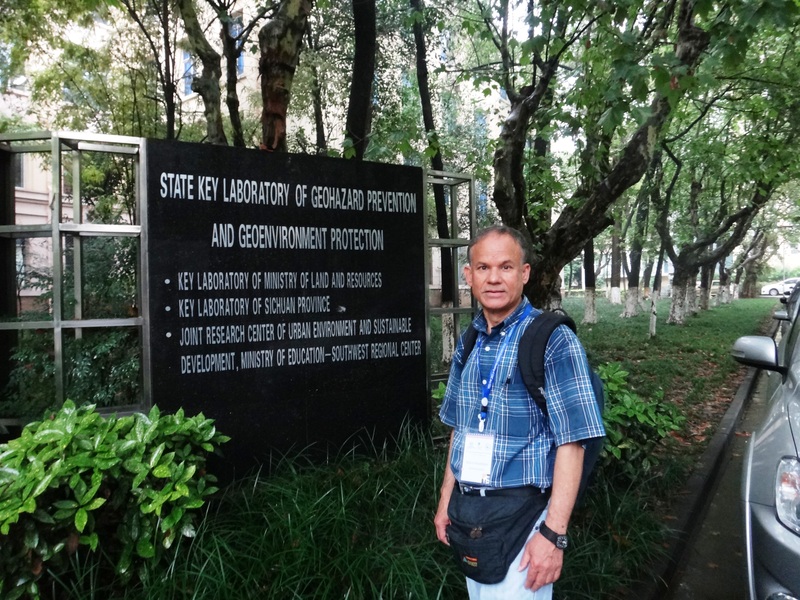 Runqiu Huang is currently at the State Key Laboratory of Geohazards Prevention and Geoenvironment Protection, Chengdu University of Technology (CDUT). It was a jam-packed morning session and over 424 registrants listened to keynote speeches in Hall A of Jin Jiang Hotel. Dr. Runqiu Huang delivers his keynote address. Dong Shuwen likens his homeland’s ambitions to study deep Earth to exploring deep space or the deep sea. For geologists, “it’s the final frontier,” says Dong, a vice president of the Chinese Academy of Geological Sciences (CAGS) in Beijing. And much as exploring the depths of space and oceans is expensive, peering beneath Earth’s skin will require deep pockets. China’s Cabinet is now weighing plans for a 15-year, $6.5 billion effort to peel away the secrets of our planet’s crust and uppermost mantle, together known as the lithosphere. Three rooms with capacity well over 150 were designated for parallel oral presentations equipped with large screen and audio-visuals. Most of the PowerPoint presentations were chronologically stored with respect to individual session and schedule by the CDUT student volunteers prior to the scheduled talks, and apparently there seemed to be no glitches at the time of presentation. Each room had several CDUT student volunteers who were knowledgeable about logistical aspects of the presentation and always upbeat and moved around as usher with a microphone when participants had questions to ask. Everything was well-coordinated and the presenters had no difficulty communicating with the audiences. Poster presentations were displayed in the late afternoon adjacent to JinJiang Hall Corridor, and each poster presenter utilized their given poster board slot measuring 31.5 inches by 63 inches. Since poster presentations were in the late afternoon, attendees had the opportunity to stroll at ease and interact with the presenters to exchange scientific information. Many early career Chinese geology professionals and graduate students proudly displayed their research in concert with Roof of the World theme topics and brought lots of scientific curiosity, opening the door for greater international participation. Ric Terman (GSA International Section) enjoyed listening to several oral presentations and visiting poster booths, and rightly commented, “An interesting aspect of this meeting was the participation of numerous students and presented papers and posters were quite a mixed bag, both in content and presentation, but certainly testified to the amazing amount of research that has been focused on the area.” Dr. Yan Zheng (The City University of New York and Columbia University), co-chair of the Water Resources and Hydrogeology session also commented favorably on various presentations and said, “overall, the level of scientific understanding and research potential demonstrated by many presenters, particularly early career Chinese professionals and academicians were impressive and certainly tectonics were the big one.” I had an opportunity to interact with several poster presenters and found an increased level of excitement, exuberance, and scientific curiosity among the presenters. Many showed keen interest to get involved with geologic projects of global significance. I think the meeting truly embodied GSA’s globalization theme and amply demonstrated this in many respects. On June 18, GSA International Section in collaboration with Exxon Mobil hosted an evening reception for the overseas attendees including Chinese geoscientists, high officials, and students. Approximately 150 participants were able to mingle, socialize and exchange scientific ideas of mutual interest. The event was highly successful and coordinated by Wesley Hill (GSA International Secretariat) and Nazrul Khandaker (GSA International Section Secretary). 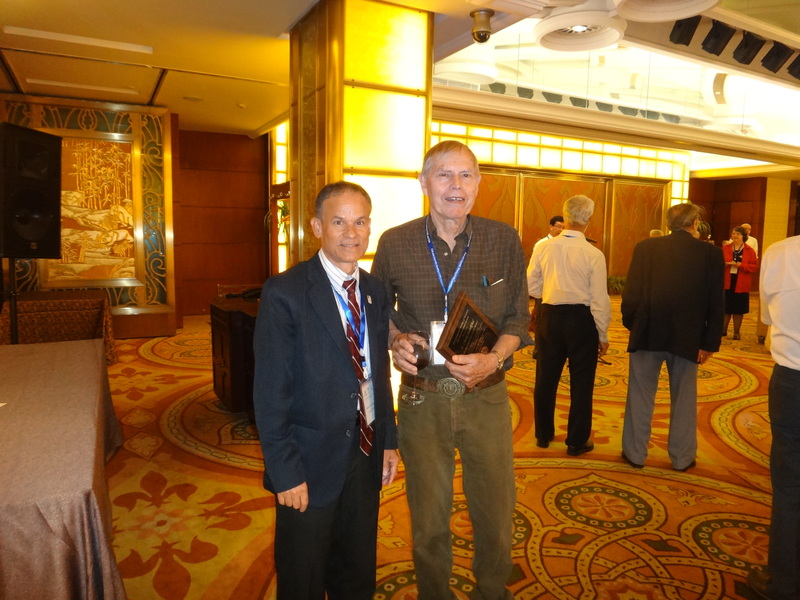 MIT Professor Clark Burchfiel was recognized by the GSA International Section for his outstanding contributions towards cementing international collaboration (particularly with China), and a plaque was presented to him by Dr. An Yin (GSA International Section Chair). A scrumptious dinner followed and everyone stayed late evening to enjoy this night. GSA International Section Secretary Nazrul Khandaker with Clark Burchfiel. Dr. Burchfiel received the Distinguished Service Award. GSA International Section Reception with Suzanne Kay and Shuwen Dong. GSA International Section Reception with Jack Hess, Shuwen Dong, An Yin, and Xianlai Meng. 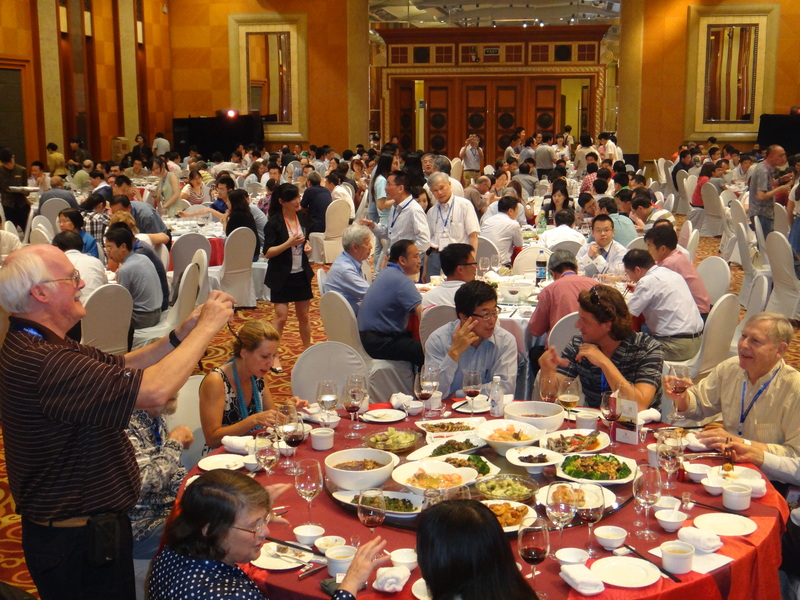 June 19 was the closing of the joint meeting and a befitting banquet held in the exquisitely decorated ballroom at the JinJiang Hotel enabled almost everyone to reflect and cherish their experience over delicious food and drink and to talk about 2015 reciprocal meeting to be held in Baltimore, USA. Successful joint collaboration between GSC and GSA! The banquet evening was addressed by Professor Ni Shijun, President of Chengdu University of Technology, Dr. Jack Hess, Dr. Suzanne Kay, Dr. An Yin, and Professor Shuwen Dong. As a token of appreciation, meeting attendees were presented with a beautiful polished rock slab (limestone) containing middle Paleozoic crinoids stem fossils. 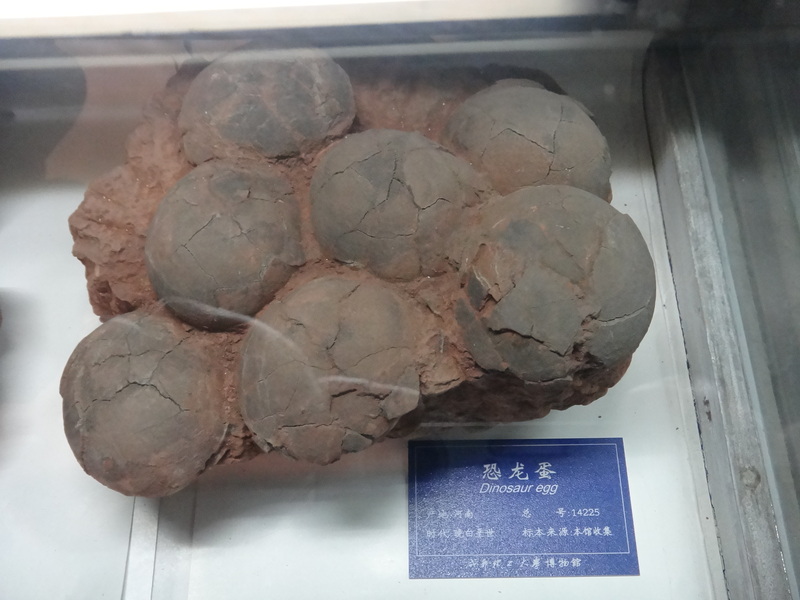 Beichuan County is the main area in Sichuan Province where crinoid fossils can be found. Compared with the crinoids stem fossils found in other regions of China, Beichuan county fossils are characterized by purity and fineness; handicraft articles carved out of crinoids stem fossils have high ornamental and collection value. Everyone was given this gift by the GSC and CDUT. Mid-Paleozoic crinoid fossils dominated this polished rock slab. 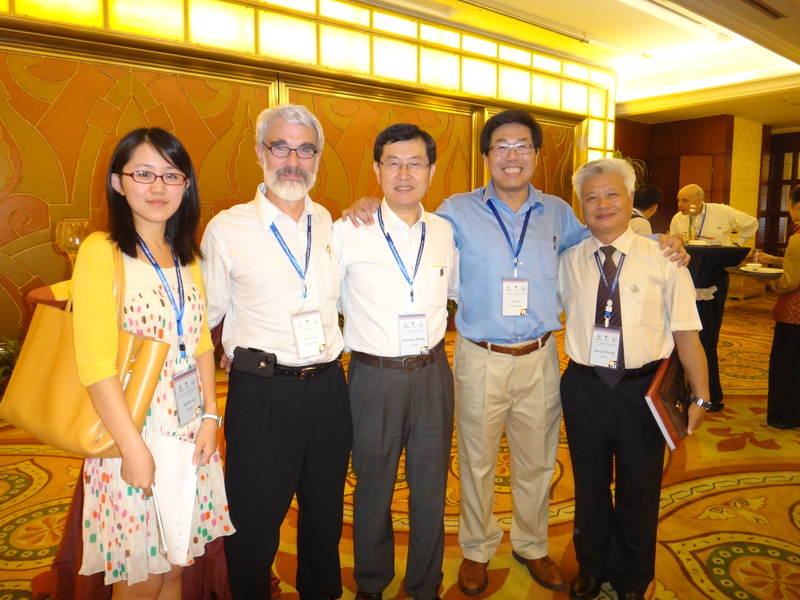 Prior to the Roof of the World Meeting, on June 14 and 15, 2013, the 7th World Chinese Conference on Geological Sciences was held in Chengdu University of Technology, and several participants also joined the Roof of the World meeting as well. Academicians from CAS, Prof. Li Tingdong, Prof. Xu Zhiqin and Prof. Li Shuguang as well as about 300 Chinese geologists from many parts of the world attended the meeting, sharing their latest achievements in scientific researches. In his speech at the opening ceremony, Mr. Xianlai Meng, Executive Vice Chairman of Geological Society of China (GSC), put forward three expectations: (1) Chinese geologists in the world would unite more tightly and strengthen academic communication to raise their academic level and capacity; (2) the younger generation of Chinese geologists should learn from the old generations of Chinese geologists and introduce the world’s advanced achievements of geo-sciences to the motherland and the advanced achievements of China to the world, so as to contribute to the national rejuvenation; and (3) geologists in the mainland and overseas would conduct joint researches to resolve the shortage of mineral resources and alleviate the loss of human life and property caused by frequent occurrence of natural disasters. Professor Zhang Youxue, from University of Michigan, spoke on behalf of the Overseas Chinese Earth Science and Technology Association (OCESTA) and the IPACES, expecting the academic communication and cooperation among mainland and overseas Chinese geologists would be further promoted. Dr. Ni Shijun, President of Chengdu University of Technology, said in his welcoming speech that it is an issue of common concern in the world to utilize the earth’s resources in a reasonable and effective manner and protect the environment for human survival. Dr. Shijun said that this meeting is of real significance under the background of greater resource constraint, more serious environmental pollution and degeneration of ecological system. He appealed that we should foster a sense of the same-fate community, grasp the right direction, and promote the development of geosciences. Prof. Xu Zhiqin, Prof. Zhang Hongtao, Prof. Chou I-Ming and Prof. Lin Jian gave reports on their research after the opening ceremony. At the meeting, 163 presentations were given by the participants on 12 topics. This conference was initiated by GSC, the geosciences section of NNSF, the Geological Society of Hong Kong, the Geosciences Institute of Academia Sinica of Taiwan, the Geo-sciences Department of Taiwan University, OCESTA, sponsored by GSC, and organized by the Chinese Academy of Geological Sciences, CDUT and many other local organizations. An overview of the CDUT from the main gate. With the help of few undergraduates, I had a rare opportunity to visit the Chengdu University of Technology (CDUT) and witness campus life on June 20, 2013. It was a very hot and muggy day, but students didn’t seem to be bothered by the weather. My first stop was the CDUT Library and as far as I could notice, there was no air conditioning in the library and in a few places I felt like being inside a sauna! Ironically no one was deterred by this condition. Students inside the library were completely immersed with their studies, research, and homework. According to several CDUT students, the campus was built by following Russian architecture and as one can see from the list of collaborators, there are quite a few Russian Academic Institutions partnering with CDUT in academic exchange program. Visiting several other Geology, Petroleum Exploration, and Geohazard Engineering facilities gave me the impression that resources needed for imparting education to the students and allowing faculty to conduct fundamental research were available. Students are very proud of CDUT and consider it as one of the premier technical institutions dedicated for preparing students in applied geosciences in order to meet the demand for both present and future. In the early 19th century, Napoleon Bonaparte was quoted as saying in reference to China, “There lies a sleeping giant. Let him sleep, for when he wakes he will move the world.” My brief visit to Chengdu, I found the true reflection and prudent assessment made by Napoleon. 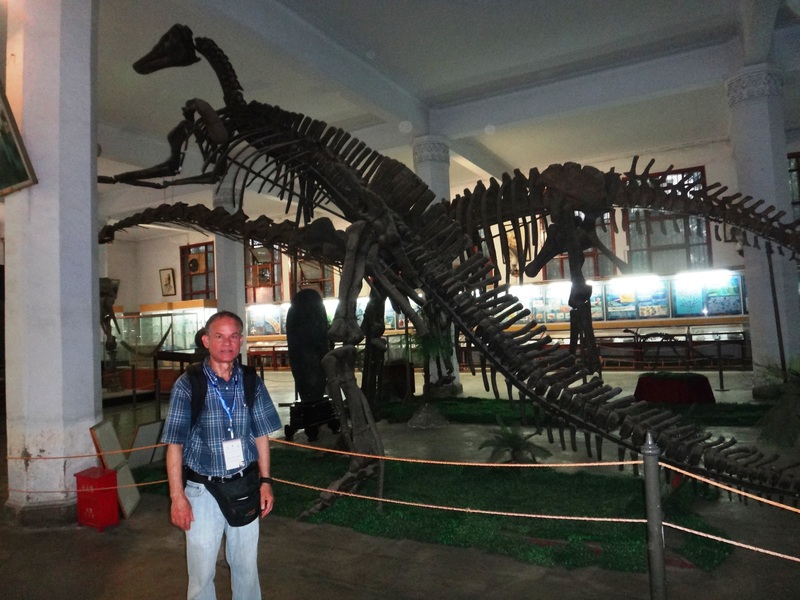 The most fascinating part of my visit to Chengdu University of Technology was the famous CDUT Museum, where well over 60,000 specimens, including exquisitely well-preserved rare dinosaur eggs, complete fish fossils (dating back to 140 million years), one of the largest Jurassic dinosaurs (70 feet long world’s longest-necked Jurassic dinosaur and longest dinosaur fossil in Asia), and neat and intricately carved jade made into flowers and other delicate and sophisticated art-forms easily draw my attention. Among the collections there are many world-class, nation-class delicacies and treasures. 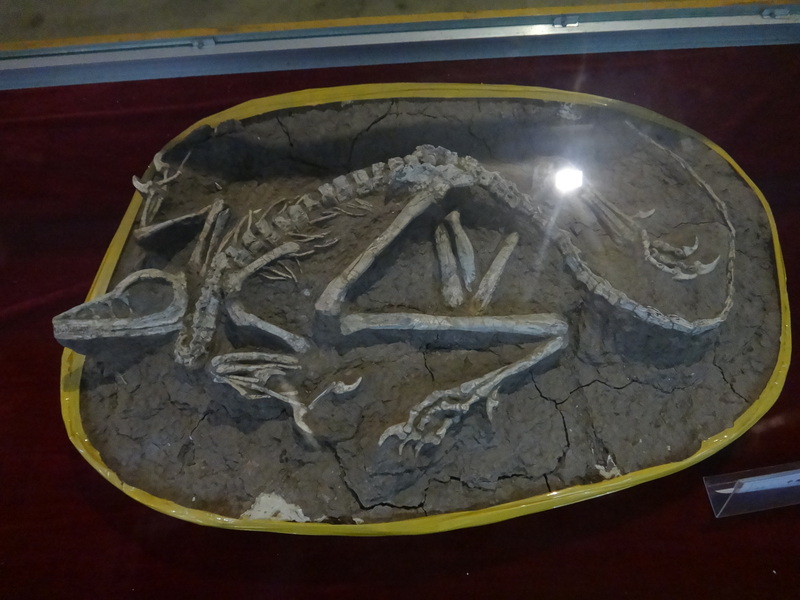 For example, the 20-plus precious dinosaur fossils rank first in number and sort among all Chinese university museums; a world-famous dinosaur fossil – Mamenchisaurus Hochanensis, which is admired as “the museum’s top treasure”, is 22 meters long and the biggest one among the integrated dinosaur fossils in China and Asia; a fish fossil – Chungkingichthys Tachuensis, 57cm in length, 20cm in width, full and distinct, is an infrequent curiosa in fish fossil world; Longchang Iron-nickel Meteorite is the earliest meteorite which have been recorded and collected in China; the system profile specimen and geological information of Emei Mountain, Longmen Mountain sedimentary facies reflect the land-sea vicissitude from Permian to Cretaceous Period in Sichuan Basin. It is certainly a treasure house for Western China and CDUT proudly houses this museum for the tourists. The Wide and Narrow Lanes which date back to the Qing Dynasty (1616AD-1912AD) are the epitome of the old life of Chengdu City . 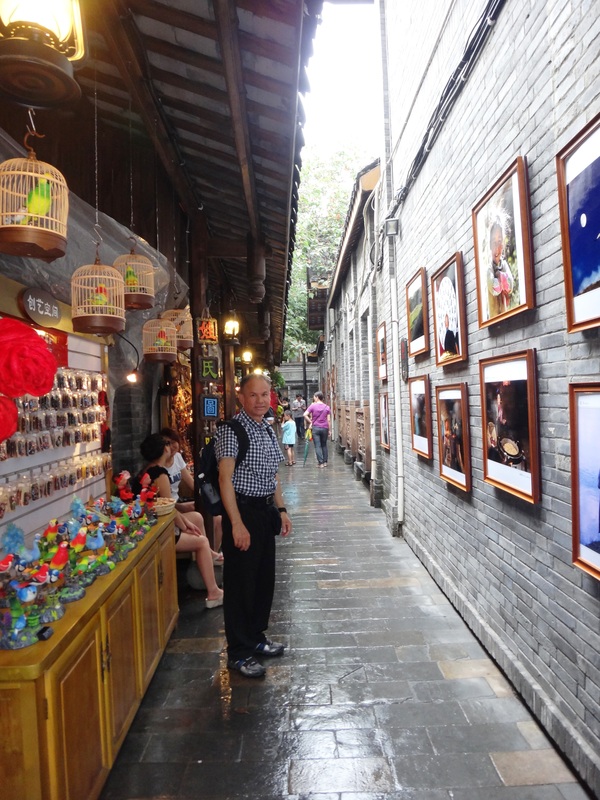 The historical and cultural area of Chengdu is composed of three parallel ancient streets and complex of courtyard houses. Wide and Narrow Lanes are two of the three parallel ancient streets in the city, and the other one is called Jing Alley (Well Alley). The Wide and Narrow Lanes were opened to tourists on 14th June, 2008, after four years of renovation and an investment of CNY600 million. Here, it has everything, from the most authentic Sichuan cuisine to Sichuan opera and tea houses. A quick stroll on the streets of Chengdu will reveal scores of tea houses. 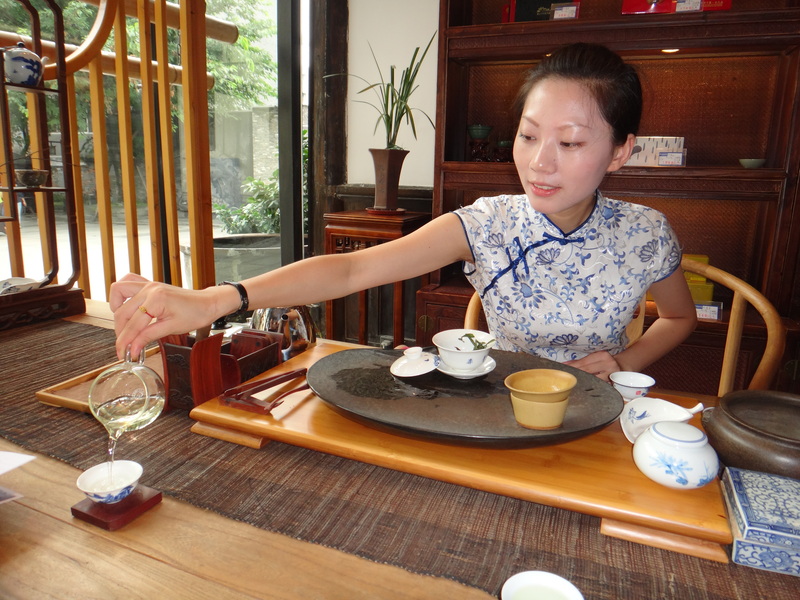 There is a saying, “China has the best teahouses in the world and Chengdu has the best teahouses in China.” The reputation is definitely well-deserved, not only because of the numerous teahouses, but also because the special way of serving and drinking tea. Traditional Tea House inside Wide and Narrow Alley. 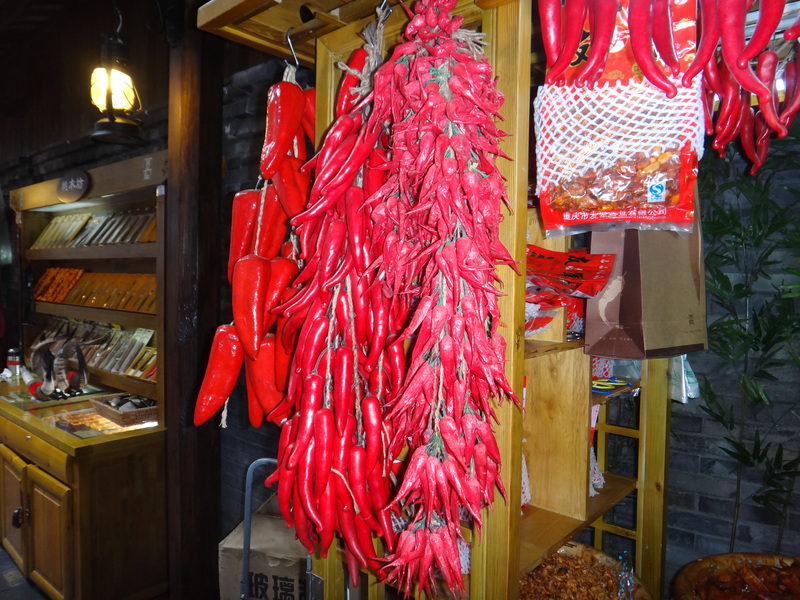 Like the teahouses, Hot Pot is another Sichuanese institution, and one should not miss the opportunity to taste authentic hot pot, chili peppers and hua jiao peppercorn while in Chengdu! Chengdu’s Famous Hot Pot Eatery inside Wide and Narrow Alley. Super hot Sichuan chili peppers used in Hot Pot. 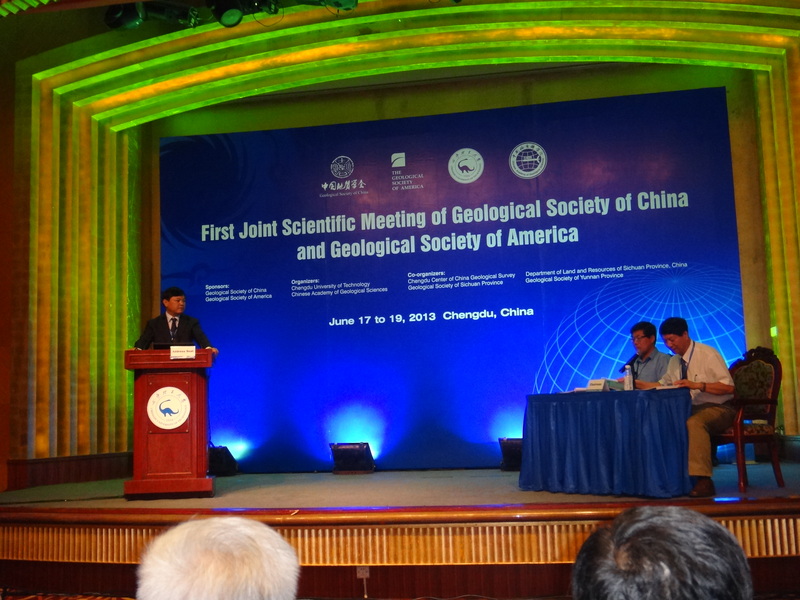 Overall the First Joint Scientific Meeting of The Geological Society of China and The Geological Society of America was highly successful and opened the door for greater collaboration with China both in terms of academic and professional exchanges for the participating geoscientists, geophysicists, technocrats, and other earth science professionals. Talking with many young early career Chinese geologists and graduate students, I noticed a wide-range of scientific curiosity and eagerness to initiate or get involved with international research projects and many through their presentations already demonstrated their superior understanding of first-order geologic phenomena. A conference like this can only promote additional scientific collaboration, testing new grounds, and an expansion of knowledge. Participants greatly enjoyed attending the Roof of the World Meeting, and left with a taste of rich local culture, authentic food, and traditional Sichuan-type hospitality. I am sure that for many, Chengdu will be missed! GSA’s current globalization mission was truly reflected in this meeting, and being an integral part of this conference GSA’s International Section strengthened and firmly established its reputation as the premier sponsor of the meeting. 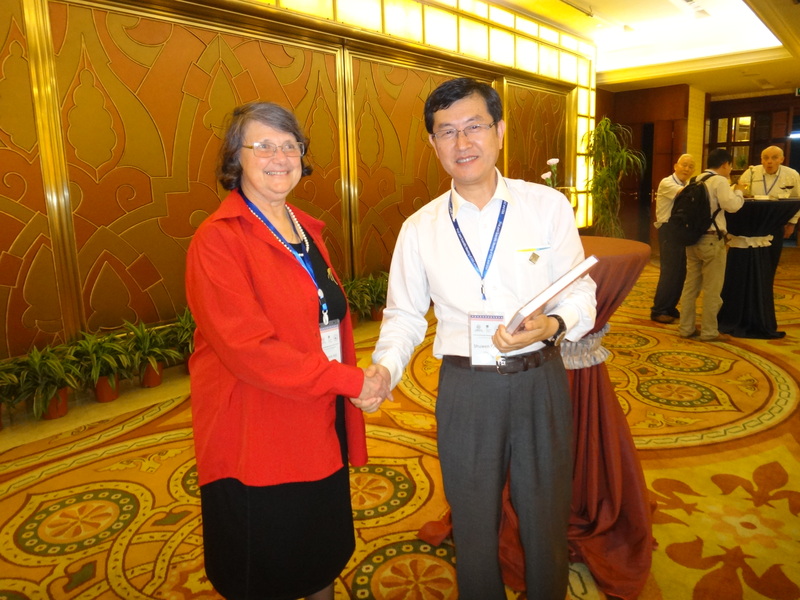 The Roof of the World meeting wouldn’t have been successful without the direct assistance and sponsorship received from Chengdu University of Technology (CDUT), Chinese Academy of Geological Sciences (CAGS), Chengdu Center of China Geological Survey (CCCGS), the Department of Land and Resources of Sichuan Province, the China Geological Society of Sichuan Province, and the Geological Society of Yunnan Province. 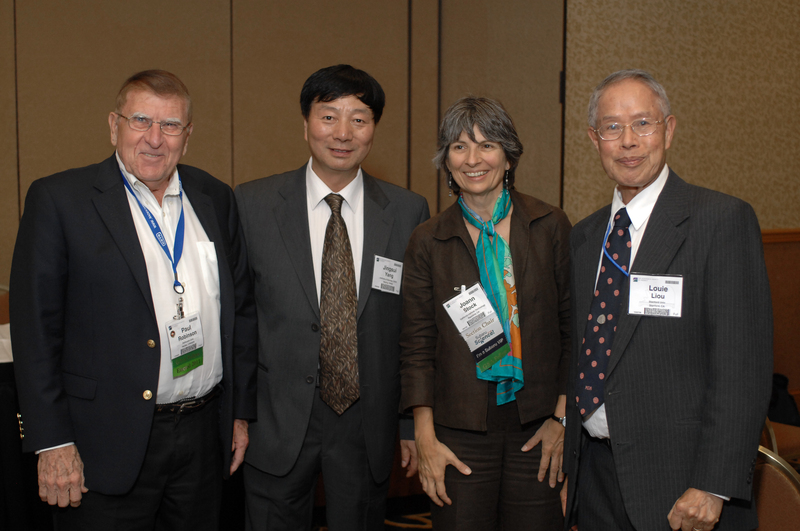 The following individuals spent countless hours, dedicating their valuable time to ensure a successful meeting, and warrant a big thank you note from the GSA and GSA International Section: Dr. Juhn Liou (Stanford), Dr. I-Ming Chou (USGS), Melissa Cummiskey (GSA Headquarters), Dr. Jack Hess (GSA Executive Director), Wesley Hill (GSA Headquarters), Dr. Joann Stock (GSA IS Chair 2011), Dr. Alan Smith (GSA IS Chair 2012), An Yin (UCLA) and GSA IS Chair 2013, Dr. Nazrul Khandaker (City University of New York – York College, GSA IS Secretary), Dr. Paul Robinson (past GSA IS Chair & currently at CAGS, China), Professor Shuwen Dong (Chinese Academy of Geological Sciences – CAGS), Dr. Jingsui Yang (GSC), Chen Zhu (CAGS), Mr. Xianlai Meng (Executive Vice President of GSC), Wang Wei, Division Chief of International Affairs (GSC), Li Jincheng, Deputy Chief of Science and Technology Department, Chengdu University of Technology (CDUT), and Kong Fanjin, Division Chief of International Cooperation and Exchanges, Chengdu University of Technology (CDUT). Finally, thanks to Exxon Mobil for their financial support that enabled GSA’s International Section to host a grand reception for the Chinese and overseas attendees, helping further conversations among the attending geologists, earth science professionals, and technocrats. As stated in the article, Genesis and Exploration was a topic that had the most presenters at the First Joint Scientific Meeting. China is interested in this topic because of their goal to keep a balance between increase supply of energy with “urbanization and manufacturing needs.” Therefore, I find it interesting that this presentations that ranked the highest with presenters dealt with more of economical stand then the following high ranked presenters which dealt with environmental safety measures such as water Resources and that. It is great to see that people can gather and present their founding or ideas about the environment and how to better it while at the same time better their businesses. Learning about the International Professionals for the Advancement of Chinese Earth Sciences (IPACES), and how their goal is to conduct extensive research about earth science again was interesting and proves how much China cares about the earth. I think this article was a great read. It showed the meeting of the GSC and The GSA, and how they touched on many topics, primarily Chengdu. It was represented nicely by many key personnel from all over which I think is very important; that way, everyone is more involved. I think it showed China in a brilliant sense and the background on Chengdu made it more appealing. It shows Chengdu as a dynamic city, which is the hub to many of the Country’s top commodities. (Environmental, industrial, financial, etc.) Overall it had many remarkable facts about the city, which I think made the article even more interesting. Very informative article, China is a beautiful place , the scenery , the people and their culture , I love that local residents were enjoying the scenery and doing physical activities: dancing, meditation, and other forms of aerobic exercises even close to midnight. This is a very interesting description. This article thought me so much that I think more people should look into the world of geology. The map and graph made this article even more appealing because it made what they are trying to show the world even more understanding. I think it is very imperative that the geological community achieve their goals because it can strengthen the world knowledge on geology. This article was particularly interesting because of it’s title and the reasoning of the conference. They labeled China as the “Roof of the World” and I was just curious as to why it’s labeled as such. Also why didn’t it take the GSA and GSC to formerly coincide with each other and share research they’ve gathered. China has always been an enjoyable mystery to me and by reading this article, it makes it that much more appealing. What was interesting was that the superficial geology of Chengdu has a high bearing capacity of gravel which makes it ideal for geoengineering. Its safe to consider the engineering of another subway line if need. Thank you for this informative article! The article was very interesting and I learned many new things. I like how the GSA and the GSC both had came together to find the problem and conquer it. It shows that in hard times people are always going to need help it doesn’t matter how tough they are, and its always okay to help somebody in need. Also the GSA and GSC shows that they the care about their community as well as environment and they just want to come together to make the situation better. It also shows that when you team up great things can happen. The meeting of the GSA and the GSC shows how there is a serious concern on the environment. Its great to see that, because they are making plans of how they will be dealing with environmental issues in the present and the future. The maps and the bar graphs were great things to use in their presentation, it made it more clear on what they were talking about. I liked the fact that their meeting reminded them to be more concerned with the environment. Overall, this article was very interesting and it impressed me most that two nations united to make the environment geologically better. This article was very intriguing. I loved how they made every little detail counting up to this meeting very important such as the location and who were going to be represented. It’s nice to hear that they want China and other countries to connect by the world of science. I hope they are able to achieve their goal because of the amount of the work they’re putting in, it should be rewarded. Science should be something everyone has knowledge of and it’s good that they’re trying their hardest to do that. Thank You for sharing this insightful article which allowed me to view how people are taking an interest in looking for new ways to improve the environment. GSC and GSA care about the wellbeing of china and are willing to make changes to better the country. From this article i learned about many interesting facts about the city of Chengdu and it’s geology. The Geological Society of China and Geological Society of America are making a difference and can make a better environment. I find this article to be very informative. The meeting of the GSC and the GSA was worth having a discussion about the environment. I liked the fact that their meeting reminded them about their need to maintain a sustainable environment. I believe that it would be a good thing to have different nations meet and discuss something that can improve our environment. This article was overall, descriptive and informative. the geological mappings of Chengdu were well made and i had not known of any such information before this article. I found the mention of the societies taking interest in Hydrology and water resources to be a good topic that should be recurring in any meetings of this nature. It promotes attention and activism to care for our environment. I really enjoyed reading this article because oh many reasons. Some of which include the amount of new things that I learned. For example, I didn’t know that this meeting between the United States and China happened. This is the creation of new relationship. I also learned about the Chinese city of Chengdu. It is a cool place to visit. I also learned a lot more about geology and Chinese and American plans. This is a great article! I really enjoyed it! The meeting between the GSA and GSC serves as a great example of how international scientific communities can overcome cultural/political barriers and educate each other on important issues. These meet-ups are especially important at a time in which our well-being and the environment are vulnerable. As the human population is growing exponentially, it’s satisfying to know that many countries are actively combining knowledge in order to deal with future global issues. I learned much about the city of Chengdu and there is no doubt that it is an ideal location to hold scientific conferences like this one. I really appreciate reading this article. I think it’s great that the Geological Society of China and Geological Society of America came together and learned from each other about the environment and resources that the country needs for further growth. The history of China is something we can all learn about, giving the readers a geological background of Chengdu was very knowledgeable, and it showed the significance of having the meeting. This information is quite fascinating. The first joint meeting between these two societies are groundbreaking and open a new door for both China and America. This is indeed the start of an oversea community in which the beneficial factors are very high. Chengdu is not only economically the perfect choice but also scientifically. This sets a precedent for cultural integration with a common interest: Geology. This is amazing and I thoroughly enjoyed reading about your experience. Thankyou for sharing this with us. I had never heard of Chengdu before and now I have learned about it. I liked reading on how this city is the focal point of science and technology, finance and other things. I expected it to be other big cities. This article gave me insight into how well nations work together when it comes to certain issues, this one pertaining to the environment and resources and developments needed to continue the growth of the country of China and to ensure that any developments and resources used are Eco friendly to ensure a safe and healthy environment for the people who live there. The fact that people from different countries attend these meetings is genius because then there is a universal perspective instead of it just being one scope of ideas. Your ‘reflections’ about this first ever joint conference between the Geological Society of America (GSA) and the Geological Society of China (GSC) provides a global , portal to decision-relevant, impartial geoscience information. This is ‘ an idea whose time has come ‘ given the current relevance of China to the world. By assembling materials from multiple geoscience disciplines and academic and corporate organizations in one place is in itself a glorious and challenging undertaking, the critical issues website is user friendly and makes it easier for users to find comprehensive informations and analyze them transnationally from across the geoscience disciplines. A riveting display of recent geocscience scholarships provides critical issues, features easy-to-digest peer-reviewed summaries, and answers to common as well deeply probed questions, and links to more detailed resources. These ‘reflections’ are plushly upsolphered geoscientifically. i enjoyed reading this article. i mostly enjoyed reading about the city of Chengdu, its geography and culture and its geology. This article is very interesting and very informative. I read in this article that the Tectonic units of Chengdu. Sichuan capital is Chengdu and is currently known for their center of interest of science and technology, etc. As I continued to read this article, I never knew how Chengdu had such a big interest on many things, and also found that Chengdu is in China. Numerous people only think of China and not other places that has or done such amazing things. I found it really amazing on how both societies of geological backgrounds united, such as GSA and GSC. It is great to see China that has a strong effect on CO2 production on earth take footsteps to lower their carbonation. I learned so much from this informative article and the most striking thing to me that inspire me was the collaboration of GSC and GSA, their seamless interaction that brought a sense of togetherness. It shows even when two countries are thousands of miles away from each other but if we can find some common ground we can all stand by each other and this conference prove that if great minds come together under the “roof” then anything is possible. The excitement of the many scientists and the volunteer is quite impressive. It is amazing to see when people are passionate about what they do. Their enthusiasm is contagious. And the dedication of the student volunteer from Chengdu University of Technology shows their love for geoscience, their love for the earth and their love for research and knowledge. One more thing that stands out to me was MIT Professor Clark Burchfiel’s quest for knowledge. Even though he is retired but he still continues his research on Himalayan tectonics. That is so inspiring. This meeting was the hub for scientists, students, and professors where everyone was able to talk about their finding , their share their scientific curiosity. In under one roof, the power of globalization is seen. Very well presented, clear and insightful, I had never heard of Chengdu until i read your article. Not much of China’s Geology is taught to us, so I found your brief synopsis of Chengdu’s geology to be informative. Good to know two super countries are joining forces to really tackle the problem! I remember reading articles on not just natural hazards but manmade hazards (Shenzhen landslide in December 2015) happening in China and thought there was no equilibrium between the urbanization of China and its geological innovation. The environmental consequences that China’s inhabitants face are really challenging, and what’s the point of urbanization if your ground is shaky (literally)? Anyway, good going GSA and GSC! Professor I have to say that this class is very interesting, Geology is the only way to learn about the earth, to know everything about why we are here and how. For me read your article about the GSA International Section was very useful and I felt great to know that in the world there are too many geologist people who care about our Earth. I see very impressive that person like Dr. Burchfiel, spent too much time doing research to show us. With this I saw that there are people who really love our planet and have the responsibility to show the world about why and how each person should take care more care about the earth. Also, it was amazing knew that there are lots things to investigate in this planet and it is important to have the knowledge of how the earth is and why people should love it like those geologists. “Geology is global and one cannot be separated from the other” my favorite quote from the reading. In the other hand, Geology are us and as a part of the earth we have to know more about it. 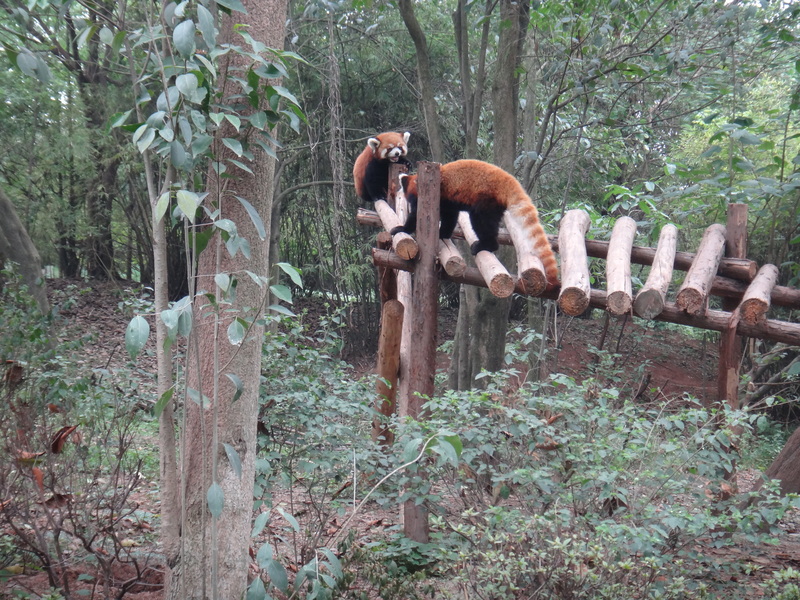 Thank you for share with us your experience at Chengdu. This event was very educative and well done. This article fascinated me to the fullest! It’s nice to see two societies team up and work together on some thing they are both passionate about. Living in a city like New York makes me wonder how people in a society can get around using just scooters, us New Yorkers might want to consider doing so so there won’t be so much traffic all the time! Enough about New York because Chengdu sounds very fun and a place I might want to visit.This was a great article. China is known as the technology and science hub. So to learn that they are also very much in tune with the environment and is always looking for ways to improve or save the Environment. Carbon Sequestration and Water Resources and Hydrology are some terms I learned for the first time by reading this article. I am a big advocate for recycling and I believe that this is my small contribution to help assist in eradicating global warming. The first joint meeting between the GSC and GSA appears to be a great chance to acknowledge and learn from the many brilliant minds working in this field. Chengdu seems like the most apt place for such a meeting from your description of its diverse geological environment. What seems more interesting is the opportunity you had to explore the culture and learn about the topics others in the field are working on. This piece of work about the GSC and GSA meeting is very well written and thoughtful. It is amazing to see the exchange of ideas across countries. I was unaware about the city Chengdu, but after reading this article and doing some research on it, the title “Best Tourism City of China” suits the city at its best. However, the missions of the International Professionals for the Advancement of Chinese Earth Sciences (IPACES) caught my attention the most. It will always be nice to see China and the United States working together on such projects. Apart from presenting the abstracts and all the seriousness, there was also a time for entertainment which is wonderful. I am glad that all the hard work of the panelists paid off on making the Roof of the World event successful! I found this article very interesting and informative. There is very little that I personally know about this country except for that it is a communist country that is located in East Asia with a very high population of people. I did not know that pandas live in China! China seems to be a very interesting place to visit and their award for “Best Tourism City of China” proves it. It is amazing that two countries like GSA and GSC got together; it will make a great deal of improvements and changes to the countries (It will make them stronger and better). However, there were few geological terms that were unfamiliar to me but images and maps gave me a better understanding of the article. Thank you for sharing this interesting information with us! I always appreciate when groups come together and work efficiently. It was great to read that the GSC and the GSA were able to set up a meeting and focus on the importance of different geological issues. Not only that, focusing on the newer issues, like resource geology, will give them a better understanding of how to find a solution to increase the “supply of energy and industrial minerals in connection with rapid urbanization and manufacturing need” while making sure that the changes are done in a responsible fashion. Thank you for sharing this information! After assessing the article the convention between the GSC and the GSA was created to promote more communication between the two associations. The two groups would go over topics that had to due with providing information and ideas on how to help preseve the earth and sustain the earths ecological balance. It was very cool to read that so many people participated in the convention which showed that these issues are important to them and it takes more than one person to try and make a difference which will help preserves earth’s ecological system. The city of Chengdu was a perfect location to host such an event because even though the convention was about to communicate on the earths issues participants are able to explore the beautiful city and learn about the history of Chengdu so the trip wasn’t only based on work which I found to be interesting. What is surprising about this GSC-GSA meeting is that it took place just six weeks after an earthquake struck Sichuam Province and it met its intended obligations, to promote and boost the academic communication between GSC and GSA that covers several topic, example, Deformation and Deep Lithosphere Processes, Deep Earth Processes through Geochemistry, and Mineral Deposits to name a few. I have learned so much from this, but one piece of info that stands out is the resourcefulness of Chengdu- it is the major foreign investment for China. It is also known and honored as the Best Tourism City of China. Such rich heritage. I liked the article a lot, I learned many new things about china that I never knew. I also liked how the GSA and GSC collaborated to talk on many different issues to try and help the world. I liked how it said that we must “maintain a sustainable environment and ecological balance given the rapid expansion of overall infrastructure and trade.”. without our planet we are nothing so taking care of it should be our first priority. The Sichuan Province in China is definitely a place I want to go once in my life time just to see all of the sights and the technology they have. This article was extremely interesting since both the GSC and GSA cam together in order to share their research. I believe that it’s spectacular that 2 different countries are uniting and talking about their research studies, a great way of learning from each other. It is apparent that both are doing a great job helping the geological world and advancing our knowledge of how nature works. Personally, I have never been familiar with Chengdu before, but I sure would love to visit it some day. I found it very interesting to hear about this location but I can’t imagine how beautiful it would look in person. There is a vast amount of culture and history there that i would be interesting in learning about. This article really shed new knowledge on me, very informative to say the least. Im glad to know that there still exists teamwork for the greater good in this world in order to solve whatever mysteries lay out there. Thank you for your informative article about your experiences in Chengdu. I thoroughly enjoyed reading your explanation of the geological developments going on in the east. I also enjoyed your photos and stories of the city, especially in terms of geology, culture and people. This is a great article and very informative. I thought the information about the surficial geology of Chengdu to be interesting. I respect Dr. Khandaker more from reading this article. I liked how I learned more about china and the city of Chengdu. Reading this great feedback makes me want to travel and visit china and learn more about the history of the culture. I learned that Chengdu is the flagship city for foreign investment for china. Also Chengdu is the focal point of science and technology, finance, trade and commerce in southwestern China. Chengdu was honored as the “Best Tourism City of China” in 2006. I appreciate all the hard work and research you all did. I like the fact that you added pictures of the maps and graphs to help me understand more. Thank you for sharing your experience. I find this article very interesting and it surely expanded my knowledge of China. This is a very interesting and informative article, since global warming is a big issue hopefully these two societies can learn from each other or share their technological advancement specifically in that area, “Environmental sessions, including Carbon Sequestration and Water Resources and Hydrology, were popular and reminded us again about the need to maintain a sustainable environment and ecological balance given the rapid expansion of overall infrastructure and trade” I was mostly intrigue by this statement because I believe it’s time we start changing. This was a very informative scientific article which showed the blend of Chinese culture and Geology in regards to social issues. I think its great that the GSA and the GSC are working together and using knowledge from each other to better their own Countries. I only hope that this meeting is the beginning of many more and that other countries will also get involved and join in. This meeting between the GSC and GSA is very important to the development of increased sharing of Geologic information. I would have loved to attend the sessions on Permian-Triassic Mass Extinctions and Carbon Sequestration. The presentation of information on the Geologic composition of Chengdu’s surrounding area was insightful, especially the cross sections of the Chengdu subway and the building foundations invading aquifer. The Sichuan province capital city Chengdu, which is apart of South West China is obtaining a lot of attention due to its science, technology skills, financial institutions and population of people. In this reflection it showed residence of the city enjoying the area, in places such as Funan River Walk with comfortable weather to be out in. With this being said, I do believe this was the perfect location for this meeting to occur. In this reflection it discusses how an Earthquake hit the Sichuan Province but Chengdu didn’t have that much devastation. One of the reasons this is so, is due to the surficial geology; this was taught to us in class. On the figure and diagrams, also stated in word there is a large amount of gravel in this area. It stated from (700-1200kPa), this means that the bedrock is strong enough support the pressure of materials on top of it. Making this a reason why the devastation wasn’t as severe. This reflection also discusses how the first joint scientific meeting with the Geological Society of China and Geological Society of America came together in the Jin Jiang Hotel. They called this meeting the “Roof of the World”. To me, the roof is a support system of a home. And because Chengdu is striving in many ways, it can be a representation of the rest of China possibly? Or it could also be referring to GSC and GSA coming together as one to discuss geological issues? I would like to know why they named it so. They also had a listing of 15 technical sessions, some of the terms I am not that familiar with. However; I do know the ones we discussed in class such as Minerals, Tectonics, Earth’s History, Hydrogeology and Geo-Hazards. Other participants who were apart of “Roof of the World” were 424 registrants, 97 overseas participants and 7 key personnel. I got to say you did a wonderful job with this article. It was so informative where I was captivated the whole time reading this. To be honest, I never thought there was a Geological Society of China. After reading this article, I’m very pleased to find out that the GSC and GSC came together to share any information with each other. I’m a great believe that knowledge is power; so for these two society to come together is an amazing thing. I feel as though incredible geologist like yourself don’t get enough credit for the hard work you do for humanity. I can’t wait until I graduate; so that I can visit Chengdu myself and experience what you have experience. If I have never declared my major, I would have gladly followed in your footsteps. Thank you very much. This article was very informative. I understand a lot due to the teaching of Dr. Khandakernaz. In this article they mention the Tectonic units of Chengdu and it give me an idea of how the region is. Chengdu is the capital city of Sichuan and is currently recognized as the focal point of science and technology, finance, trade and commerce in southwestern China. The GSC focus is on resource geology in order to meet the demand for increased supply of energy and industrial minerals in connection with rapid urbanization and manufacturing needs. which is very significant to the world. As the GSC and the GSA come together and combine information is has huge effect on our world today. this should influence other countries to step up as well. Also congrats to my professor for contributing his time and effort to better our environment. This was a very informative article and embraced my knowledge and understanding of geology and showed how different countries such as china may use science as a way to expand our knowledge.The Geological society of china and the geological society of America were a part of a national meeting known as the roof of the world the meeting was set in place to promote. Promote on the academic communication between the GSA and the GSC, within the meeting there was a wide range amount of topics that were covered, two in particular being the Gas Hydrates and mineral deposits. These two topics were of focus having the highest number of presenters and giving china a focal point on resource energy in order to meet the demand for an increase supply of energy. This is just a piece that I found interesting. This article was very informative, it is great to see a country like china who has a great impact on the great CO2 emission on earth take steps to decrease their carbon footprint. It was also great seeing the GSA and the GSC join forces as well as learning about all the hard background work that got them to join together. The article also taught me about the geology of chengdu and the areas surrounding making me feel as if I was there for this great step. Hopefully other countries can begin to take steps like China has it would be great step for man kind ! This is such an intriguing article on the landscapes of china. As a spontaneous traveler and wanting to travel to china the learning that the Gsc-gsa went on a six day field trip to promote a “roof over the world”. to help the environment in china and the rest of the world. Congrats to Dr. Naz and his team on making the earth a better place. This article was very beautiful about Chengdu( China). I got more knowledge from this article about the China. the Jinjiang hotel looks so nice .. want to visit This hotel. I think that it’s great that the Geological Society of China and the Geological Society of America are working together, to help and learn from one another. Before reading this article I had never heard of the city if Chengdu, but after reading this article I learned a lot about this city. This is a major city in southwestern China it is, “the focal point of science and technology, finance, trade, and commerce. I think that it is amazing that 424 participants attended this conference in 2013 and 62 were from the United States. With all of these participants it in attendance it gives the GSA and the GSC a huge opportunity to learn from all the new studies that were presented at the conference. This was a great article because both the GSA and GSC came together to share their research. I think is wonderful that two different countries can come together and talk about their research and learn from each other. Both organizations are doing a great job to help in the geological world and to advance in learning the ways of nature. I have never heard of Chengdu before and I would love to visit that place someday, it was interesting to hear about this place but I would love to personally visit and see it for myself. There is a lot of culture and history there that I would love to see. This article really thought me something new, it was very interesting and informative. I’m glad there are people willing to share their research and work together to solve the mysteries of the world. This article was extremely informative. I was unaware of the “focal point of science and technology, finance, trade and commerce in southwestern China” called Chengdu as described in this article. The vivid way the capital was described was enlightening I was able to visualize as I was reading. More importantly the information about the meeting between the Geological Society of China and Geological Society of America was enriching. It is inspiring to know that great powers such as China and America can work together for the greater good off our knowledge and environment. Topics such as Continental Deformation, Geo-hazards Petroleum Resources, Permian-Triassic Mass Extinctions, Water Resources and Hydro-geology and Gas Hydrates are absolutely vital to our existence. These meetings are necessary to ensure sustainability and to provide knowledge about our environment, and could be resourceful in our future. A very insightful article that I’m glad to have read. It’s always great to see two nations come together in the name of progress and science for the betterment of the world. In this case, to see the GSC and GSA meet and contribute their collective knowledge of geological science to address new means of energy resources, addressing geological topics like Geochemistry, mineral deposits, petroleum and water resources, and many other topics. Chengdu sounds like a very interesting city, with such a rich background regarding science and technology, along with its reliance on the environment around it for energy needs, yet at the same time managing to care for it with little harm. A fitting place for the GSC and GSA to have met. It is great to hear how the GSC and GSA get together to discuss similar geological issues. This article was very informative on the geological aspects of Chengdu. It is interesting to see that their 14 million inhabitants have skills in science and technology which is very beneficial and to see their input in conserving the Earth by riding around in scooters which are far less pollution to the Earth compared to cars and more convenient to get around with. I had never heard of Chengdu, China before and feel like I learned a lot about it from this article. The meeting between the Geological Society of China and Geological Society of America was a great thing. I think the more contributors to the geosciences the faster our knowledge grows. Two grand countries and others came together to discuss important topics like “carbon sequestration”, “water resources” & “hydrology”. They emphasized the importance to maintain a strong and healthy environment given to the fast expansion of infrastructure and trade. Very few places in China get their water the way Chengdu does. Most cities have rivers that flow through the interior. However, Chengdu uses groundwater from mountain reservoirs. I wonder if China feels confident in their aquifer water, mining for coal in the near western mountains. It came to a surprise to me however, that there is a conscious emphasis on the environmental aspects of this new growth in China. Its refreshing to see that the United States is overseas involved with issues and ideas that can beneficial for everyone. This article helped understanding why that specific city? But reading further, one it describes that the city of Chengdu as a science, technology, finance, and trade focal point. That it houses 14 million people with science and technology skills. This article opened my eyes to see that with determination anything can be possible when trying to solve major issues. Its nice to see the steps the geo society are making to change the future. It was interesting to learn about a country I’ve never knew about. This article allowed me to see and learn how advanced yet different Chengdu is from NY as well as the similar. It’s great to see the GSA and GSC geologists join in efforts of coming together for a common cause of discussing shared issues from two different parts of the world. This blog was outstanding. The way the article was written made me feel like I was part of the journey. Learning about Chengdu was exciting.I learned Chengdu is “recognized by many as the focal point of science and technology,finance,trade and commerce in southwestern China.” It amazes me how in China people are allow to use scooters as a mode of transportation.Not everyday do you hear about people using scooters to go travel from one place to another. This blog written by Dr. Nazrul Khandaker is outstanding. The way this article was written made me feel like I was part of this journey. Learning about Chengdu was exciting.The city is an ideal place to travel to, especially since it is surrounded by beautiful scenery. I learned Chengdu is “recognized by many as the focal point of science and technology, finance, trade and commerce in southwestern China.” It amazes me how in China people are allow to use scooters as a mode of transportation. Not very often do you hear of people using scooters to get from one place to the other. Overall, this blog was insightful. The article was very informative. I learned a lot of new things from reading it. I didn’t know that Chengdu, the cpital city of Sichuan primarily focused on science, technology, finance, and trade. It is a well accomplished city primarily because of the different areas it focuses the on. I find it fascinating that Chengdu is boarder end by mountains. The meeting between the Geological Society of China and the Geological Society of America was a great way to speak about important topics concerning geology. The session in the meeting titled “Mineral Deposits: Genesis and Exploration” is a very important topic because minerals are found around the world. In the meeting, that session had the most presentations. From this article, I really liked the different diagrams detailing the geological aspects of Chengdu. Overall, the article was great and I learned about a city in China that I’ve never heard of before. I didn’t know that Chengdu even existed but now I do from reading this article. This article is very interesting and you provided enough information. I liked the way you provided images to share your experiences. Also I enjoyed reading how passionate you seem about geology. Thank you for that. This was a very interesting and informative. The geological societies just came together to discuss their passion of geology and the images were very helpful and educational. This article was very well written and informative. It was interesting to read about the the city of Chengdu. The background knowledge of the city helped to understand how important the meeting was and the significant role it played. Geologists’ discoveries and research make a difference even though people do not realize how. These countries and their similar interests and sharing their ideas, observations, research and conclusions will help to reach their goal faster. The field trips to different regions looked exciting and as a person that wants to see more of the world, Chengdu seems like an ideal spot to visit with the variety of foods and cultures. This was a very interesting read to learn about cities like Chengdu, a place I have never visited but hope to one day. This blog gave me insight in the geology and society of Chengdu and very different the landscape of Chengdu and America (more specifically New York City) and very different. It is great to see two countries coming together to give insight into different research and abstracts being presented to each other. I liked that you pointed out the need for balance in ecosystem between infrastructure and environmental stability. Now I have background information about Chengdu and hopefully get to visit Chengdu or any other city in China. i really enjoy reading this article and it is fascinating how we learn new things every day. it was very informative and, as far as i am concerned, i am impatient to learn more. Learning how these two different countries share the same common goal and interest is by far amazing because we are basically across the world from each other. By coming together and sharing our thoughts and comments with each other can better the world because every idea should be expressed somehow. Having a conference in a different place is a great way to meet new faces and introduce your ideas to them. Chengdu is an amazingly beautiful place to visit. This article along with the other article has proved to me how geologists can make a difference in the world. Everything that is researched and studied can be very helpful in the future. They have also showed me how united the geology community is and how geologists from all over the globe can come together and just become one. It is very interesting to see how many people share the same interest and I can just imagine how much more interesting it is to have actually lived these experiences like you did professor. Thank you for sharing these articles with us. This is a great article that provides us, the reader, with interesting details on the City of Chengdu. I am surprised that many of the Chengdu people use scooters instead of cars but it is probably more convenient since it takes up less space and does not require as much gas. I like how to they created umbrellas that cover both them, the driver, and the passenger from the rain. While reading I noticed that some areas in both Deyang and Ya’a are made of up of yellow-gray silt clay and fill that take up about 1-3 meters of the upper surface layer which brought a question to my mind wouldn’t these areas be prone to flooding?. We have learned that areas with fine overlying materials or made up of landfill are prone to flooding but I am guessing they probably have a storm drainage system to prevent such events which is probably why they decided to have a lot of rivers run through their city. I took the time to read this and i have to say that i wasn’t disappointed, its great to see that two different groups, like GSA and GSC, gather up for the same reason. It was a really good article, i can almost say for everyone that i felt like i was there with all the good details that you give about the meeting. Im glad that people from 12 different countries are participating. This is a great and informative blog. As a student that is currently planning to study abroad in China, this blog occupied with information’s has made me a step ahead of other student because of the information’s that I have acquired from this blog. For example, I know what to expect in some cities like Chengdu which happened to be one of cities that my group and I are going to visit next year January and it’s the capital city of Sichuan province in China. This article is very informative to students like me, the picture explain what they were doing. I would like to visit places that are beautiful like this. This was a very interesting and informative article to read. There were many things I did not know about until I read this. It is great to see this meeting that brings the GSA and GSC together, and to focus on a lot of common issues about geology they both had. It is great to see two organizations come together and talk out key issues. And I have never about about the city of Chengdu, the most I hear about is Beijing or Hong Kong. Reading the facts about Chengdu, it is a very interesting city that I wish I to visit someday. I didn’t know it was the fourth top city in China relation to the permanent resident population. And all those mountains that it is surrounded by, it seems like a sight to see and gander at! I have learned a lot from reading this. This article is very interesting and educational. Geology is something people don’t realize is an important subject and to see both china and the United States are willing to work on things to improve on china’s geology.I personally would love to know more about up and coming experiences that you will encounter in the future. This narrative about the first joint international meeting between GSC and GSA was very informative and was intensely engrossing! It is great to hear that the interchange between China and America was a great success and that they united to discuss about major environmental issues. I hope that this congregation bring many advantages and benefits and that we all gain something from this wonderful research. I’ve learned a lot of new facts about Chengdu through your depiction of great efforts. It was very compelling of how they would get around the city on their scooters. That really is just amazing!! This sure seemed very adventerous and reading this makes me want to go through such great experiences and travel to Chengdu!! Thanks for sharing your marvelous, wondrous, awesome, and inspiring experience!! I really liked this article.The way you described the Chengdu city and its environment. The discription of its landmarks and the under ground system was described well with it’s diagram. In my opinion this kind of research is fun and can be called as hobby because it seems like there is many advanture and new discoveries. I had never heard of Chengdu, China & I feel fortunate to have you as my professor in Geology and bringing these places to light. Maybe one day I might get the opportunity to visit such a peaceful place doing meditation and aerobic exercises. I like the idea of riding the scooters and waiting patiently @ the light until it changes green. What a society! Now about the meeting between the Geological Society of China and Geological Society of America, that was a very good thing that these 2 mega countries & others could come together to discuss such important topics like “carbon sequestration”, “water resources” & “hydrology”. They stressed the importance of the need to maintain a strong & healthy environment given the rapid expansion of infrastructure and trade. All of this is very important as we are living in changing times. This article was very interesting and informative i learned a lot about the city Chengdu and how involved the GSC and the GSA are in terms of improving and educating each other on the geology more specifically in China. This article was pleasant to read. After reading a number of comments it seems allot of people enjoyed how Chinese and American scientists came together in this meeting under common interests. I think this kind of collaboration is critical to solving issues due to how different view points and skepticism of this volume end up refining an effective strategy in solving the issues presented that day. Seeing the way that Chengdu gets their water is like very few cities in China. Most cities have rivers which flow through their interior, unlike Chengdu which uses groundwater from mountain reservoirs. The maps being of extreme help, I was truly able to get the hydrology of the area. I wonder if China feels confident in their aquifer water, mining for coal heavily in the near western mountains. Being able to see the center of China must have been great Nazrul, super excited for you! Unity is a beautiful thing. What one person cant do is something a group of people can do. Teamwork is something everyone should try to do. Together we can accomplish great things, discover new items to show the world our buried history, and learn new ideas from each other. This article is a very important informative piece because I was not aware of this great city, Chengdu. It is fascinating to learn that Chengdu is a f China’s focal point of finance, science, trade and technology. After reading this article, i learn that Chengdu is a good place for foreign investors. Most importantly, I appreciate the work that GSC and GSA is doing. This article is very interesting and helpful. This article is truly impressive job. This article gives a lot of interesting knowledge. I personally believe that the Geological Society of China and the Geological society of America having joint meeting to discuss and exchange topics regarding our world is beneficial globally. Even tho they are only two groups out of many different possible groups that cover the mass of the world, I think its a great start in bringing the necessary information needed to operate our world better. Hopefully these meetings influence more groups from all over the world to join and share their knowledge as well. As far as the city of Chengdu with all its intriguing tourist attractions and historical value, after reading this I would be marveled to go for a visit. Im excited to see that the US is communicating and collaborating with a country that is becoming a world leader in the geosciences. I say the more contributors to the geosciences the faster our knowledge of it grows, especially when scientist from different parts of the world start to reach similar conclusions, we’ll know that we’re on the right path. Seeing China’s interest in geology comes as no surprise to me when considering the rate at which the country is expanding in terms of infrastructure, energy demands, and technology, but what did come as a surprise to me and something I’m also glad to see is that there is a conscious emphasis on the environmental aspects of this new growth in China. I was surprised with the modern beauty of the city Chengdu. I am very happy that the geologists of America and China have assembled in trying to improve the world we live currently. its shows that people want to make a change everywhere on the planet, its the only one we have .This paper reinforced the beauty within an urban city but the disadvantage that also come with it such as polluted air. Great article Dr.Naz! It looks like you really enjoyed your time in China and all it had to offer! Its pretty cool that you were able to attend such an event, and experience the culture and the environment of China. The article was really detailed and informative and I learned things that I had no clue about, like how the Chengdu meeting place is divided into three units: the upper surface layer with yellow-gray silt clay , the middle with brown- yellow gravelswith silt clay and silt and the bottom with the red, thick-bedded mudstones of the Cretaceous Guankou Group. Thanks for sharing! This article was very thoughful and highly informative. I like the idea that both China and USA working together to solve geological problems. This article is a real eye opener to the growth and expansion of a place I didn’t even know about. It explained a lot about Chengdu and how the people who live and work there. Chengdu sounds like a place where great minds and ideas are born. it definitely makes the USA look insufficient in its progression of geological matters. I am glad that the U.S. and China was actively working together to solve a lot of the geological problems that exist in the world. I feel that these meetings are crucial to the improvement of relations between the world’s leading powers and that they benefit everyone involved. I greatly enjoyed reading this blog on the background and geology of Chengdu in China. I gained a lot of knowledge on the GSC & GSA and their objectives of the meeting that was held. I look forward to knowing more of your travels as well seeing more of these city’s in the future. By reading your article on the GSC and GSA it truly enlightened me and many others about how it was one of the earliest scientific organizations in China and on giving us information on Chengdu. This article is very interesting on how the meeting took place between the GSA and GSC. What I found most interesting is how mineral deposits was the focus of the meeting due to the increase of demand on energy and the industrial minerals. Also mentioning on how people live their daily lives, an example of using scooters as their main transport. Very interesting over all. Reading this blog on the geology of Chengdu in China was very educative. I gained a lot of knowledge on the GSC & GSA and their objectives of the meeting that was held. Thank you for sharing your trip to china and the geology of the city you visited. In reading this article, I found it profoundly informative and quite intriguing for the matter of what information is packed into it as well as the findings and how it directly relates to the earth and the upkeep as well as tracking –– all in tandem to the important role that geology plays in sustaining this earth that we all inhabit. I’ve particularly never considered the geology or the environment specifically in China or any other country for that manner, because I for some reason thought that America as ‘The’ Superpower had taken prime leadership in everything that went on and just assumed that everyone would follow the lead they took. That is now clearly not true, as the concerns for many different regions within the world does vary – and this article proves that. It is a bit worrying though when we think about it all, how scary pollution is and how it can end up affecting us…our health and the survival of our species…humans. This article was very informative, in went into depth on what gsc and gas got together to do.It’s also interesting his the easiest way to get around in chengdu is on a scooter, i would like to see so many scooters waiting at a traffic light. Your article expanded my knowledge on the geology of china. thanks for sharing. This article is very informative. Thank you for writing such an interesting blog about GSA and GSC … Now I know a lot about chengdu. I’m really interested in what you think about the scooters in China. Do you think Americans should also follow the culture of riding scooters instead of cars for fast transportation and, in my opinion, to save gas? Seems like a beautiful experience, I know you enjoyed it. I didn’t know Chengdu was such a famous part of China because I actually never heard of it. And I was definitely shocked to know that a lot of people rode scooters in a country like china. Overall it was definitely an interesting article. I’d like to thank you for sharing this article with us. I don’t know much about China, but this blog was truly informative and interesting in a plethora of ways. I liked how GSC and GSA had brought everyone together for a greater good. It just goes to show, that some people in today’s society do appreciate nature and would like for it to be in a stable condition. I thought this article was very informative and interesting. It is great to see that the GSA and the GSC came together to discuss china’s recent interest in Geology because of their need for energy and mineral resources due to urbanization.I had no idea Chengdu had such a high proportion of Technology skills or that is was famous for tourism and historical culture. Truly interesting, with the rise of China on a global scale i think such information if useful for the need of energy and mineral resources due to urbanization. Thank you for sharing your article “The Roof of the World.” I enjoyed reading your experience and every other part of the article. I am glad that “Roof of the World” was a such a success. I have never heard of Chengdu, but now that you have shared so much, it making me want to go visit that place for once. After reading your article, it was very interesting to learn about the geography on Chengdu, China. 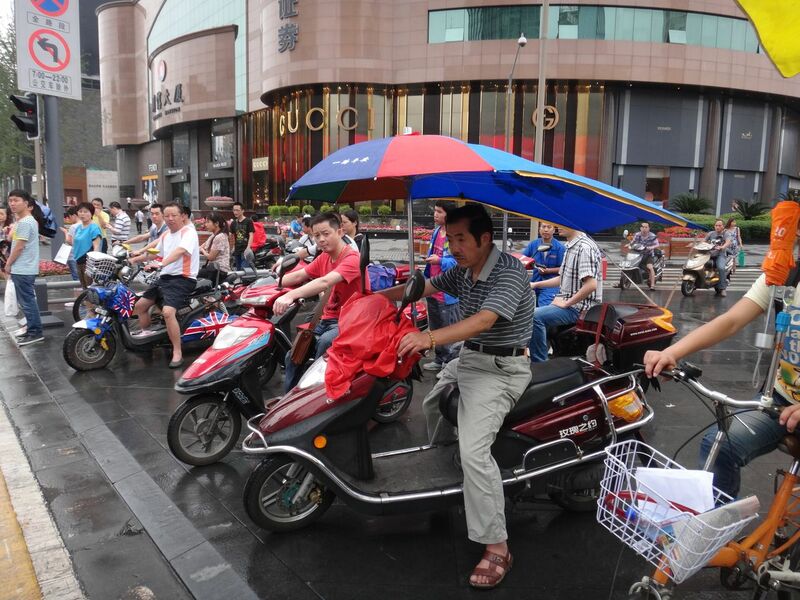 Your article indicated that in Chengdu, the most easiest ay to get around is by riding scooters. Also the temperature in Chengdu was very hot and humid. The article was based on GSA and GSC working together. Glad to see you enjoy doing what you love. I for one, through reading this intriguing and information filled text learned a lot more about China than I had ever known. Thanks Professor for the wonderful share ! This blog is one of the outstanding blog that I have ever read. The meeting between international Geological societies is one of the best things that could have ever happened. I like the way you mixed up culture of city of Chengdu with geological and biological elements. Prof you are one of my best teachers i ever met and i am very lucky to have you as my teacher. I wish you more success in this field. This article was highly informative not only on the environmental aspect of China, but also socially and culturally. I really enjoyed the geological history of China that you provided. You enriched my knowledge about Chengdu. I found it interesting about the three strati graphic units regarding the different sediment layers. I hope you continue to explore and educate the world! This article is very interesting you seemed to take full advantage of your trip, not only attending the meeting. Your observations on the culture and the area around where you were staying were very astute. The Dujiangyan Irrigation System is very interesting it shows how even long ago that people could work together to overcome and help provide their land with what was needed. I only wish you had more information on it, now I have to go look up this for myself. Your observations on the commercial openness of china was also interesting. Dr.Nazrul khandaker truely a great article and it was very interesting for me and the visual pictures that you posted on the site made me understand more about the topic. This article was a really good read. Very interesting information. Must visit China one day. Very interesting article. I really enjoy the read it was very informative. One day I much visit China to get a hands on experience. Very interesting article I really enjoyed the read. There is so much to learn about China. After reading your blog I am now more interested in visiting China and have first hand witness of all that China has to offer. My grandparents visited China and loved it so its on my bucket list I’m glad you enjoyed your visit. After reading your article, I was infatuated with the modern beauty of the city Chengdu. I am very ecstatic that the geologists of America and China have assembled in attempting to improve the world we live currently. I find the experience you have shared on this blog illuminated and gave me more an insight on how urbanized China currently is. 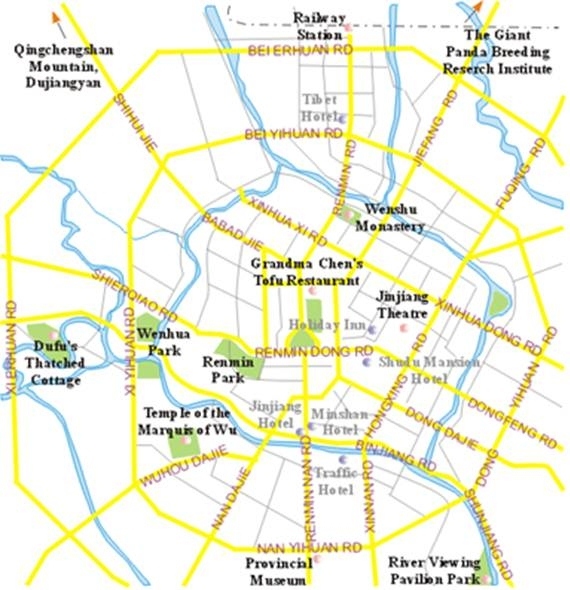 I never knew that Chengdu is a major city Western China. This article reinforced the beauty within an urban city but the disadvantage that also come with it such as polluted air. Although, Chengdu is beautiful city as mentioned quite a few times there needs to be improvements with the city’s involvement with nature such as trees, plants instead of increasing industrial plants. Thank you for the opportunity for sharing one of your piece of work. Your article was presented with great detailed that one could just picture it in their mind. It was good seeing both the US and China coming together and share their research and seeing these two group (GSC and GSA) sharing a common interest. It is very interesting that Dr. Khandaker that was able to be a part of this ongoing conversation that was occurring in China. I wasn’t aware of the demand of energy that China was now trying to obtain due to it’s increase in urbanization. It is a fact that for life to go one we need a sustainable environment which might not be the thing a CEO of a fortune 500 company may want to hear. It’s a pleasant thing to see that both the GSC and the GSA are working together to explore a middle ground for all parties involved. Hopefully both of these groups have opened the eyes of those companies. Your article expanded my knowledge of geology in China. Your vivid explanation on the mountain ranges in the city of Chengdu makes me want to see it for my own eyes. Thank you for the very informative article. I really enjoyed reading your article, it thought me alot more things about geology in general that i din’t know. I also loved the title of your article “Roof of the world” and I’m also happy you had a great time in Chendu, it made me want to go and visit there sometime soon. It will give me a more broader on Chengu. Your blog was very interesting. It was very well written with lots of details and important information. If I were a geology major, I would have loved to attend to this meeting. I have learned a lot after reading this article. Such as the GSA and the GSC. Dear Mr. Khandaker i must say this was truly a remarkable article. I am pleased with the fact that two successive teams, the GSA and the GSC came together and had their very first meeting as a group. I am pleased to accept the fact that Mr. Rajendra Persaud from york college has given me this great opportunity to read such a terrific essay! After reading this informative piece, I became more interested in visiting China. It amazed me to see how different countries are intrigued by what happens on Earth. The thing I found most interesting that there was so much work to arrange and organize GSA and GSC meetings. It was also good to know that both societies, China and the U.S joined together because I’m sure it will bring benefits for both countries based on the scientific aspects. It was really nice to see the geologist of China and the US coming together under one roof to discuss the many aspect that is happening in togethers society. It is effort and collaborations like this that will make this world a better place. I am delighted by the information and research done in this blog for us readers to feed off of. I look forward to reading more of these type of blog and intense work in order to benefit our environment. In a city with a rich culture as this one is great to see how new development is able to coexist in the city and the citizens are able to embrace the change. It was really nice to see the geologist of china and the US come together under one roof to discuss the many challenges we are facing today in society. We need more of these effort and collaboration in order to make a better world. I look forward to reading more informative blog and research as you have been doing. This article is very informative, reading about the city of Chengdu. Chengdu is the flagship city for foreign investment in China. As a city famous for its tourism and its historical culture. I learn this from Figure 2. Thanks for opening up my mind about china and its geological features. Your trip to China is very inspiring. I am a firm supporter of learning about new cultures. I believe there should be more support around cross cultural studies, it is a completely different experience to learn from first hand instead of reading. CHINA has great some advantages over the USA, mainly their growing economy, therefore learning about them is definitely beneficial. It’s great to see how countries are still taking out time to care about the earth and what goes on within it. I hope these meetings bringing GSA and GSC together continue, so that both communities can share these ideas and methods to prosper in the earth sciences. Since these meetings enabled participants from various parts of the world to attend and present their research I’m sure they will be able to figure out ways effective ways to help the earth. I like the fact that you sharing your articles, the posters figure 1 was informative on the evens. It have given me more interest in geological societies. I love presented talks and posters as shown. China have lot of interesting geological outcrop, which are far from good understanding. What i would love to see and read about is the GSA to go to India because they have so much to offer to the SGA. You have been posted a great blog for us about geology. I was wonder to see Chinese culture and their activities. The geologist are trying to give conscious about the earth. I am so happy to take geology class with you. Once again I would like to thank you for sharing your journey with the York College Students and community. 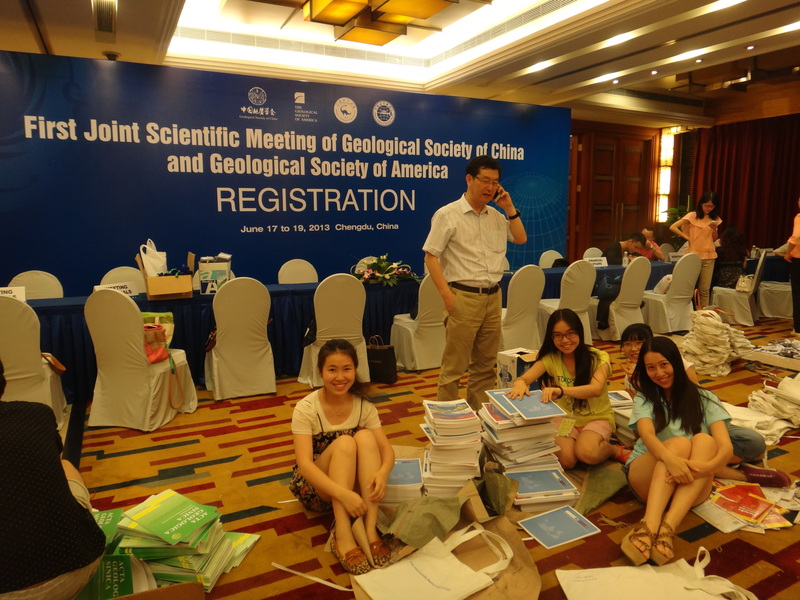 It’s amazing how your trip was the first joint scientific meeting of Geological Society China (GSC) and Geological Society of America (GSA) which is a door-opener to geologists all over he work and a chance for academic communication between the GSC and GSA. It’s wonderful to hear about a different city and I enjoyed reading about the culture, economy and history of Chengdu. This has been very informative and I truly did not know it took so much work to have such a great GSA and GSC meeting.You have done an excellent job sharing your experience in China. Great work! This article gave an interesting view of China for many of us who are unaware of others places and don’t have a chance to get a firsthand account of life elsewhere. The geology insight was great and it was nice to get some cultural/lifestyle information as well. Some aspects remind me of NY. Usually, I find comfort in the familiarity of home and because of this I fail to consider exploring what exists outside. After reading this article, I cant help but admire all the lovely things I’ve learned about Chengdu. Most definetly I would like to go visit and explore this lovely place. I commend the great work being done over there by the geo scientists and I wish nothing but progress and greater achievements. Your trip to China seemed like a very interesting and exciting experience. I’ve always been fascinated with China due to its growing economy. That is something I believe us Americans can learn so much from. I think the US and China joining together to promote cooperation in earth science will be a great thing for both countries. I also love the pictures you posted especially of how they get around in scooters everyday. That would be great if we had more scooters here too. I was very much pleased with your article and learned about a few things that some of you and your colleagues are studying. Like: The continental deformation and the critical changes in the earths history. I have gained some knowledge about whats going on around me and beneath me. I’m truly delighted and amazed by the facts put together through your blog. I love the way the Geologists of the USA and China came together under “The Roof Of The World”. We definitely need much more of these kind of teamwork in making our society and the world in which we live in today better. I acknowledge your hard work in taking part in such a field in feeding us very informative & interesting information. Keep it up and looking forward to reading much more. The Name of the conference says it all. Very informative, very important, not only for the students but for everyone as a whole. I have learnt a lot about geological structure of China and have an opportunity to compare with the United States. Keep it up Prof. Nazrul I. Khandaker. Special thanks to Mr. Rajendra Persaud for keeping us posted. This article was very informative. It was very interesting to read how geological societies bonded and came together. I also got a lot of from the pictures that were included in the article because it gave me more of a description. To the Respective Dr. Khandaker, I must say that this was a very fascinating article! I am pleased with the fact that the two teams, the GSA and the GSC both came together and had their very first joint meeting on the geographic location and description on the great city of Chengdu. As to the impressive and very intriguing description and the usage of graphs and other diagrams portrayed the city of Chengdu sounds wonderful and I would surely love to be able to see it some day. Thank you for such a great article and thanks to Professor Rajendra from York College for giving us the honor to read it. I was not aware that geology could contribute to how energy was increasing. Industrial minerals I am not quite sure of what they are referring to in this aspect but rapid urbanization and manufacturing needs are met. I was so happy to hear that the GSC and GSA came together to host the first joint scientific meeting.I thought the theme was very appropriate ‘Roof of the World” 125 years ago GSA was founded. Coming together for this conference really showed how much has really been achieved. Firstly, thank you for sharing your experiences with us. Chengdu is a place I’ve heard of a lot from my dad who travels there often. I hear it’s a beautiful place with great views and gorgeous scenes. I am not much of a geology person but I’m glad you have included a lot of information on the city, it’s history and culture, weather and other aspects. I have to admit that I wasn’t aware of these organizations such as GSC, GSA that orgranize these meetings to discuss and present various ideas, informations and knowledge regarding resources. It has increased my knowledge overall and thank you again for sharing your knowledge and experience with us. This article was extremely interesting! Thank you for sharing your article, it was extremely informative! It have given me more interest in Geology. I found this blog very interesting filled with an abundance of information about the first joint meeting between the GSC and GSA. Surely, the conversations between the respective groups were in depth about some of the many aspects of geology. By using graphs and diagrams to accurately illustrate the focus of hydrology and other resources in an effort of maintaining a sustainable environment and ecological balance, due to a direct correlation of trading and overall urbanization to be remarkable given the high focus of technology in Chengdu. On another note, I was surprised to read that Chengdu was the “Best Tourism City of China,” and not Beijing or Shanghai. As a brilliant repesentative of Geosciences at York College, your experiences in a fraction of China’s culture and geography developmental studies internationally is highly appreciated. Thanks for sharing the article ,I don’t know much china, the highest number of presentation was about minerals gneiss rock exploration and it was sort of obvious because china is an advanced country and most things here in ny u see the label “made in China”. Also if China is one of the best tourist place then it will be in my list ” 21 things I must do before I die”. Traffic and pedestrians: if the easiest way to get around is by scooter I can’t imagine the hours of traffic there would be driving a car, and it’s hard to believe people wait patiently to cross the street, here in NYC people seem like they wanna walk over someone’s car…we’ll in some crowded areas. 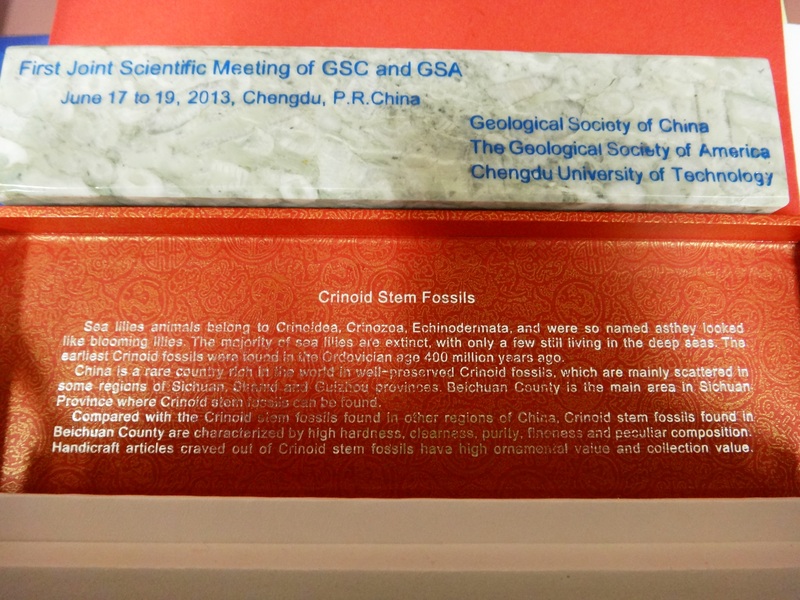 Thanks for sharing your experience from the joint Scientific meeting of Geological Societies of China and America. It is interesting to note that most participants were more interested in the session on mineral deposits compared to the Environmental session. I know that meeting the demand for increased supply of energy and industrial minerals is of utmost importance to the continued development of China but carbon sequestration and optimizing water resources should also be paramount. Great meeting though; right step in the right direction. This was certainly a very interesting article filled with an abundance of information about the first joint meeting between the GSC and GSA. Surely, the conversations between the respective groups were in depth about some of the many aspects of geology. I found the focus of hydrology and other resources in an effort of maintaining a sustainable environment and ecological balance, due to a direct correlation of trading and overall urbanization to be remarkable given the high focus of technology in Chengdu. On another note, I was surprised to read that Chengdu was the “Best Tourism City of China,” and not Beijing or Shanghai. Regardless, this was an informative read about two communities with common criteria’s. Never knew parts of china there would be different types of environment going around. It’s a nice place to see considering the fact that they care about conserving water, plus in some parts like Chengdu people only use bikes and scooters. Chengdu is a beautiful city and looks really lovely to live in, peaceful place just to relax. I think that it is interesting how in China they want to increase the people’s education of geology. I had no idea that the first map was created there. This blog post also gave me some inspiration to visit China one day. It seems like a very interesting and adventurous place to be! This blog post was very interesting and opened my eyes to how important it is for countries to interact on behalf of planet earth. Indeed it is very important to inform others on what is happening in geology. Great read! I have never been to China but Chengdu looks like a place that I would want to visit in the future. There are so many things to see and do which makes it a great vacation spot. It was really interesting to read about your experience on the GSC and the GSA coming together for a meeting. It shows that geology is socially interactive and expanding internationally. I am so overwhelmed by your passion to expand geology and the importance of nature awareness globally. You truly have a talent and skill that is very unique to you and you take joy in feeding others with that gift! Amazing Job!. I hope your next goal is to visit more countries and further expand your horizons of thinking! This is only the beginning! This was a great learning experience for me, because I have received a lot of information from this article. Chengdu is a very interesting geological area because it provides so many helpful resources to geologists. The IPACES did a very well job in bringing together two great countries to carry on research on earth science. Once again professor thank you for this opportunity, and for the knowledge you share with us. At first I have to say thank you for outstanding blog. This article talk about a bouncy of geo scientist giving their valuable time for the expanding GSA. It also talk about china environment , fertility of soil, culture and traffic system. Totally it’s is a great article. Thank you once again for letting us be a part of your great experience . I like the fact that the geological society of China and the geological society of America came together as one to discuss very important geological terms. It shows that these discussions are very important because they have to do with the future of humanity and the world. Also, I learned a lot about the City of Chengdu and was able to understand what was being said due to the knowledge I gained in your class about earth quakes. Lastly, its a honor to have such a great professor representing York college in these events. Thanks you for your insight and showing a keen interest with respect to geology contents. Great and job and thanks for all this information on the work that is been done in regards to geological research in China, and how America is collaborating for such an important cause. Loved the title of the meeting “Roof of the World” and learned many new things about the city of Chengdu. Indeed, Roof of the Word is a catchy title and surely meaningful when it comes to China, particularly Tibet. I am glad you enjoyed reading the blog. This article was not only informative on the geology of certain chinese regions but also informative of the background history. From this article i learned many things on Chengdu. Being known as the “best tourism of China”, which is established for its fertile soil, favorable climate, and novel Dujiangyan Irrigation System, I enjoyed reading the article and looking at the pictures. I can see that a lot of work and effort has been put into this blog and i appreciate all of your hard work Professor Naz! It was a pleasure to write this blog and I am very happy that you are able to get a glimpse of the Chinese culture and geology as well. Thanks for your input. Yes, if you get an opportunity, I highly recommend you to visit Chengdu and sample her rich culture and appreciate spectacular landscape. Your reply is very much appreciated. Thanks for your time to read this blog. this article was very interesting. its really interesting blog because it shows that people do care about our nature and wants the nature to stay natural. and this blog shows that the two countries are working together to make the nature better. most important of all and this blog talks about “promoting and bolstering the academic communication between the GSC and GSA”. Thank you Miran. Greatly appreciate your feedback. I am glad you enjoyed reading the blog. Thank you for sharing us about geology knowledge about Chengdu city. Even though I am from China, I don’t know Chengdu well before. This article helps me know more about Chengdu. It riches my knowledge. And Chengdu is a famous city in China. It is really interesting experience you had in Chengdu. First, thank you for sharing us this meaningful experience in Chengdu. I am from China, it is exciting for me to see these pictures took in China. I am pleased to see the good communication between GSA and GSC. It is helpful for geology scientists to get more knowledge. 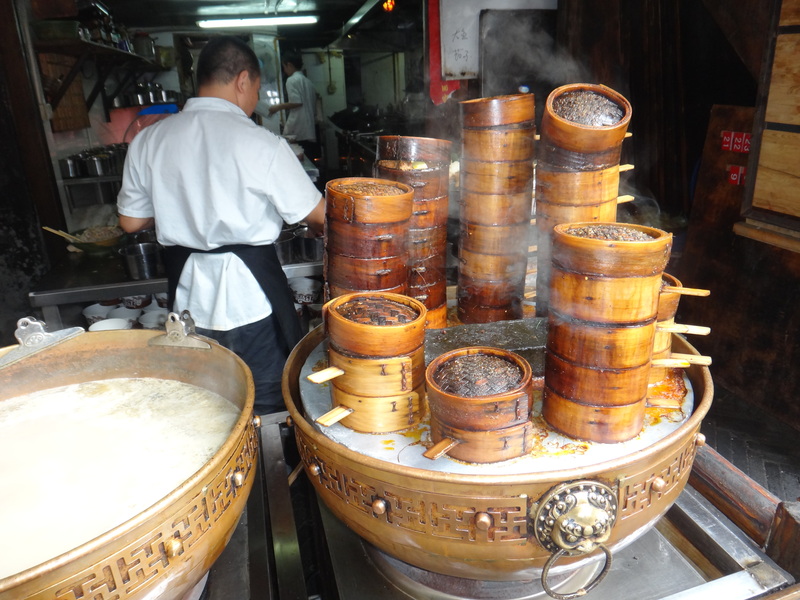 Otherwise, Chengdu is a good place to visit and there is many foods to eat. Yes, food is fabulous in Chengdu; Geology is spectacular too!! Hope you can visit Chengdu to sample hot food. Thank you so much for sharing this article with us. I now understand have important the work of a geologist can be. I now see have there are people all around the world willing to do what you do, and that you are not the only really smart Professor out there trying to make a change in the world. Once again, thanks for the article, and keep working together with others to make a difference. I appreciate your time and nice feedback. I was intrigued by your observation relating to the role of geologists in mitigating societal matters. Great Job Dr. Khandaker! I was really interested in reading this log, it was very informative. I did’nt have any previous knowledge of the amount of behind the scene work and dedication that went into arranging, organizing and planning this joint GSA and GSC meeting. It was very impressive that there was such a good show of support, as indicated by the wide range of research. I’am happy to see unity and others supporting each other. Geologist come together to show each other support is awesome. Being in Chengdu had to be very exciting to, I could tell by this blog.Congratulations to you on a work well done and being able to explode the world in different areas. I do hope this collaboration is one of the first for the GSA, not only in China but other countries as well. Thank you for sharing your article ‘The Roof of the World’ and also experiences behind this. It’s amazing to read about the experience you had at Chengdu. Thank you Sakura for your brief comment. What a fantastic experience, and great read! Thank you for sharing this article with me. I loved the various figures which helped me understand better what happens at Chengdu, and how the conference unraveled. I am not a geologist, but enjoyed learning this! Dear Monica: Are you on with respect to forthcoming GSA’s Annual Meeting to be held in Vancouver? Yes, it was a long journey and I was very delighted to see the culmination of the event which you were aware of from the beginning. Chengdu was a great place for doing wonderful geology and Roof of the World meeting was equally fantastic!! This was a fascinating article that brought to light various things pertaining to Chengdu. For example, when one thinks of a cities to visit in China, Hong Kong is likely be one of the few listed; however, Chengdu was named ‘Best Tourism City of China’, yet is not widely known for its touristic appeal. What I particularly enjoyed about this article was that it was not lavished with unnecessary jargon, which would have diminished my overall understanding and the information I was able to take away. It was also nice to read about the ‘Roof of the World’ meeting which potentially served as a forum for participants to present their research. The 66 United States participants out of the 97 oversea participates is a clear indication of the strong foothold that America has during such conventions. Thank you so much for posting your feedback and I want to assure you that my intention was to bring science and society together and keep concerned citizens abreast of what’s happening with respect to cutting-edge geoscience research and frontier exploration activities, particularly in China. I am glad you enjoyed this write-up. This was a very interesting picture of China’s interests through the lens of geology. The Figure 1 chart was particularly intriguing in this, demonstrating what topics China is focusing on geologically. It is fantastic to see the level of involvement that took place in this meeting, and from so many different countries to boot. It is also great that this sort of cooperation can take place between the US and China, who can be considered competitors in the global society. Very nice blog. this article did indeed provided me with knowledge about chengdu that i previously had not known, such as its geographical aspects and surroundings. what stood out to me most was the passage that spoke about America’s role in this study.it eas intriguing that many Americans represented the country’s geology program by participating in the fourth and final circulation. This was an amazing article, was very interesting, Chengdu sounds like a wonderful place to live or visit it has a nice climate, environment and geography compared to where i live and the people sound like there also very friendly. i thought it was awesome how almost everyone there commutes by scooters. i also thought that it was great that the Americans and Asians got together for a great cause to better education and improve society to better mankind. and to top every thing off the pictures was very informative they can me a great insight in to Chengdu and how it is in reality not just words. This article is interesting. I’m especially curious in understanding the silt deposits in the areas adjacent to Chengdu and the how the different rocks from different time periods came together in those areas. But wouldn’t the characteristics of the rocks in the different eras have different characteristics and make it structurally unstable and create problems for construction there? Thanks a lot for sharing such a pleasant experience and congratulations to you on a work well done. Is very important promote cooperation in earth sciences between China and the US and other countries, to advance earth science research and education but for other countries as well. When I started studying we´re in the first course in geology 180 students, now just 7!!. There is an urgent need to excite with earth science. Thanks for adding your own observation with geology enrollments which I think is quite alarming; however looking at the trend in the US institutions, enrollments in the geosciences are increasing and showing lots of potential to remain steady. It is largely due to renewed interest in geology dealing with environmental issues. You are right about countries working together to bring opportunities for the incoming geology students and create an environment for rapid growth of the earth-system science. I am very thrilled to have read such an insightful piece on your experience at the GSC-GSA gathering. You did not only enlighten us on the geology and demography of Chengdu, we were also able ameliorate our knowledge of the city’s culture. Such meetings will help create stronger bonds between the two parties (the world’s powerhouses) – which may eventually pave way to uncovering some of the world’s geological mysteries. Congrats on your trip and thanks for sharing. I commend the efforts of the collaboration of GSA with other geological societies throughout the world. It provides a broader prospective of geological events happening today in locations we may not generally be aware of. Understanding geological happenings in other countries can help us with strategies and approaches to understand those occurring in our own countries. The article regarding the geology of Chengdu was very informative and provided many interesting details of the city I did not know. his is a very informative and interesting article. It was great to learn about the city of Chengdu being the “Best Tourism City of China” and the focal point of science and geology. The Geological Society of China and The Geological Society of America is doing a great work at these meetings. Although the “Roof of the World” meeting is very informative about the geography of the city to meet demands of the increase supply of energy and industrial mineral. I believe that this information prepare the city for natural disasters, such as the earthquake that took place six weeks before the meeting. I really enjoy reading this article. I liked how not only you spoke about what GSC and GSA are doing, but you also gave some information on City of Chengdu. I also liked how you explain your time during your meeting in China. I would like to visit the city of Chengdu and would like to be as lucky as you were and visit Chengdu University of Technology. Thank you for sharing your experience with us who didn’t get to go. Hope that you will be able to continue on going to different places and write about them for those of us who cant go. this was very informative, i never heard of this part of china. i am glad i read this it really helped me expand my knowledge of geology and provided me with a different insight on china. Thanks for the interesting and informative article about the GSA-GSC meeting that took place in Chengdu. The article was very detailed about the collaborative efforts between the United States and China that made this meeting a success. it was great learning the geological background of Chengu as well as the culture. I hope to one day visit this beautiful place so i too can write my own blog about it. I am glad to see so much research going on in the field of geology because it is such an important aspect of science that we all need to be more well informed about. This article was very interesting. It’s amazing how both geological societies came together to look into it.Reading it give a very informative picture of what was happening. am delighted to hear that you were able to witness a meeting between the GSA and GSC, and hope that continuing such meetings will yield the most beneficial results for both the United States and China, as they both have come a long way. This article was very interesting to read. It helps build my knowledge in the geology of China. Nice to read that two powerful nations as the US and China is able to work so closely on a topic that is extremely important to the world as geosciences. I’ve learned a lot about the city of Chengdu, especially about its geology, society, economy, infrastructure and culture. To my surprise, this was a very interesting log! I’m not big on geology but after reading this, it definitely sparked my interest. I’m happy that “Roof of the World” was such a success. I never even heard of Chengdu until now and after reading about the different mountains and how its the best city for tourism, I definitely want to add it to my bucket list. You gave a great description of the city and even the culture which is very much appreciated. I loved the part where you mentioned that they “follow their designated path with no apparent conflict with pedestrians” because god knows that doesn’t happen in New York! This article its great. It gives you a brought understanding on how the geology of different countries such as China expand our knowledge in their sciences. its great to know the there still organizations that want to collaborated for better benefits in the aspect of the world(ecologically) . If people could work as a whole we could have better understanding and we can find solution to confront the environmental issues that eventually help in the geosciences . Thank you for sharing such a descriptive article about the First Joint Scientific Meeting of GSC and GSA. Great to see organizations such as the Geological Society of China (GSC) and the Geological Society of America (GSA) working together. This is my first time hearing about Chengdu, you did a great job explaining the culture and environment of Chengdu. After reading this article, I want to expand my knowledge of earth science. This is truly a milestone in geological history. I remember you sharing your excitement about this trip and your anticipation for the wealth of knowledge you will get by visiting China. This joint convention of GSA and GSC has open the doors to information sharing and opportunities for geologists around the world. The various poster presentation you mentioned coincides with the many challenges we face in the world. It seemed that a lot of hard work, time and determination went into making this meeting a success. I enjoy reading about the culture, economy and the geological history of Chengdu. You have done a great job sharing your experience in China. I believe that now the ball is in our court and its time to step up and invite the Chinese to our home. The next meeting should definitely be in the United States. This article was very interesting to read. It help build my knowledge in the geology of China. It grasp my attention when you talked about the City of Chengdu and how it is recognized for its focal point of science and technology, being that i’m very big on technology. Most people, including myself, just think of China and not of Chengdu. 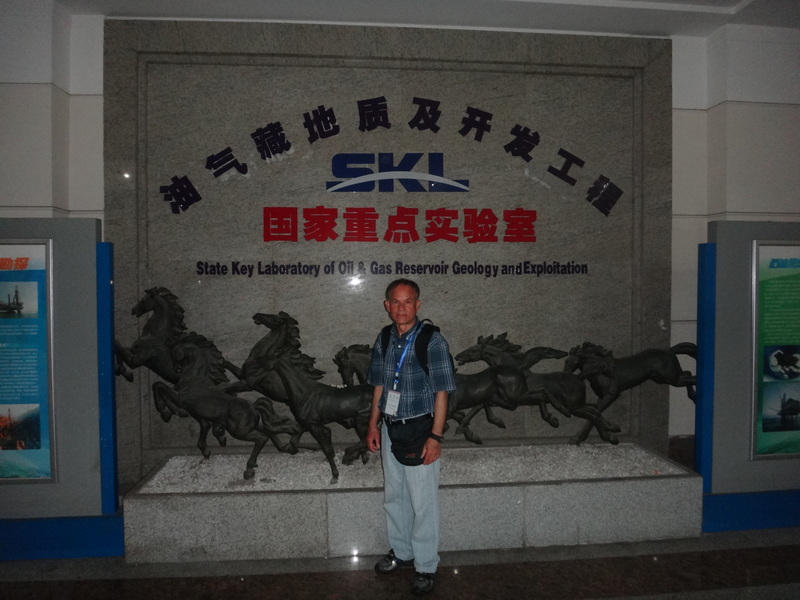 It was interesting to learn about the geological society of China. It was very informative. The city itself seems worth a trip ! You did a great job on this article in explaining not only the environmental but the cultural and social aspect of your visit to Chengdu. I liked how this article explained the history of geology in this area and mainly the detail you included about the way you adapted to the conditions of modern life on your trip. Its great to know that the first meeting with GSA and GSC was s successful one. I especially liked they way the people of Chengdu use scooters as a means of transport. I’m sure that benefits the environment in China drastically! This was a really good and informative article. I wish I was a part of this collabortion between our GSA and GSC. From a touristic and geological point of view, the city sounds really amazing and a sight to see. I am really excited when thinking about all the future scientific advancements that this event will make possible and all the doors that will be opened to us as American geologists. I am very proud to know that one of my College geology professor was a major part of this event. This article is a very informative masterpiece with very precise details. I like how you incorporate the different scenes around you; this gave me a detail image of what’s happening; by this I feel like taking a trip to china. Also I like how you blend the culture and geology together in the GSC meeting. Thanks so much for sharing an informative and educational article. I am very pleased to hear of organizations dedicated to the advancement of geosciences such as the Geological Society of China (GSC) and the Geological Society of America (GSA) can work together to make the world a better place. This article was interesting because it covered several important topics; as a result it expanded my knowledge of geosciences. I have really enjoyed reading this article. I look forward to reading more of your articles. Again, thank you for sharing your article and keep up the good work. Love the article!! It is so informative on so many levels. I loved that you not only covered the scientific aspect of the meeting but also so the cultural environment of the city itself. It is a wonderful feeling to know that my mentor was instrumental from the begining in planning this important event! If only the governments of various nations could get along like their scientific counterparts….the world would be such a better place. The area is beautiful…what a great place to study geology! The mountains and lower terrain and the untouched beauty of a land centuries old make for a great study! This was a really monumental event for American geologists. Thank you Dr. Naz, for being a part of this collabortion between our GSA and GSC. From a touristic and geological point of view, the city sounds really amazing and a sight to see. I am really excited when thinking about all the future scientific advancements that this event will make possible and all the doors that will be opened to us as American geologists. I am very proud to know that one of my geology professor was a major part of this event. A good collaboration between two big countries in Geology area! I found this blog very interesting with great information that expanded my knowledge about geology. It is great and admirable to know that there are groups of people including you, who get together and share their ideas and information to make the world a better place. I believe this is the only way we can help improve the world by informing others and teaching them what is going on and how as individuals one can make a difference not only in your community but worldwide. Thank you for sharing your experience with us, I really enjoyed it. This was a very interesting and informative blog post. Thanks for providing some insightful analyses about the field of geology. It is very interesting to know how much we are affected by the conditions of another country. I never looked at the geological aspects of the world, we are so busy with our daily activities that i never get a chance to realize how the world around us is changing. Thank you for this information it totally makes me look forward to this class. It was informative to read about the meeting in Chengdu from you.Nice to read that two powerful nations as the US and China is able to work so closely on a topic that is extremely important to the world as geosciences. I a proud to know you are so involved in this field and also my professor. I hope to learn a lot from you on this topic.Chengdu seemed to be a very interesting place to visit.I did some additional research on the Dujiangyan Irrigation System and Chengdu Research Base of Giant Panda Breeding and they looked amazing. After reading about Chengdu and seeing the pictures and also knowing how important this city is to science, technology, finance, trade and commerce, i would want to visit some day. This article was very informative and helpful because it covered several topics of geology. It also expanded my knowledge of Geology . Interesting to see that the GSA and GSC intend to share their scientific knowledge. It’s particularly pleasing to know that Dr. Khandaker is a member of the GSA team that is instrumental in forging this cooperation. It seems quite fitting for the meeting to have been held at this location. Chengu seems to be strategically positioned where it is surrounded by geological formations of stark contrast. This is a geologist’s paradise. A very informative and thorough blog. You provided an almost tangible visualization of your experience and it was very much appreciated to all of us. It is pleasant to see different groups of people collaborate in such a unanimous way in the support of an equally appreciated cause. And also, i am very certain that the meeting in the US is highly anticipated. Some information that stood out to me, although not geologically associated, was the diligence and enthusiasm of the students that were faced with what many in western society would call, “uncomfortable circumstances.” It reminded me allot about my high school experience in Trinidad where myself and other students were often faced with situations which were at the time, minor and often occurring, but would be considered a problem in different cultural mentalities. Thank you for the information you provided. It was very interesting. Also, the information provided about culture of the people that you experienced and observed was very appreciated. It is a proud thing to be taught by a professor who is well known and sharp in his field of expertise. Dr.Naz, this is fascinating, thorough and filled with a lot of geological information that is easily overlooked. I’m quite proud actually to have had a professor who is out in the international field providing solutions on a global scale. It makes me recall the lectures, that geology, especially when it comes to digging and tectonic stuff, is worldwide. I find it very profound and perhaps way overdue to see nations come together in a positive way looking for solutions to a problem. Your article covers a lot, from the average bustling city life of ChengDu to the beautiful untouched mountainous regions. This article makes me want to expand my knowledge of international geology as well as visit ChengDu. This is amazing! I had no idea you went to China. It was very insightful knowing that ChengDu is one of the earliest scientific organizations that formed in Tianjin in 1909. Looking at the Figures 4-7 is just quiet fascinating to know such complex geology that goes on. Its like you get a blast of information from our past, it just so amazing. The article was well written and vivid. You get a great sense of feeling of the city of ChengDu. Dr Naz, that was a very interesting and informative piece of writing. It really opened my eyes to the world as a whole and not just focusing on where we live. So far with your article and your classes, I’ve learned that geology is universal and what happens in one place affects others thousands of miles away. It’s good to see that complete strangers will come together for such a significant purpose. Thank you once again. Political ideologies aside the Chinese People have learned how to live on the Earth. A good example is the Dujiangyan Irrigation System. This system as seen from Google Earth looks like a boarder line breaded stream. I find it amazing that after 2000 years that sediment load has not contributed to greater local flooding by decreasing the depth of the canal. This must mean that the topographic gradient is high thus giving more energy to mechanically weather cobbles and boulders. Turbidity looks high from the map view so the Chinese Engineers past and present must of found a way to incorporate the fine suspended load into the soil of the farm fields and draw drinking water by the use of settlement ponds(?). In all through this GSA and GSC meeting I hope that we can learn from China a way to use the Earth’s resources efficiently and in harmony with our space ship. I was pretty amazed that America was present and not just present but at the fourth and final circular there were many American registerants. 66 of these were from the United States. Im glad they have accepted that we do have many geographical issues n have stepped up on our we can resolve them. This article successfully highlights the many geological issues our world faces in 2013, as well the prioritization of these issues (Mineral Deposits: Genesis and Exploration being China’s recent focus on resource geology conveyed by Figure 1). This essentially proves why the collaboration and dialogue between the GSC and GSA through the Roof of the World China meeting is essential understanding geological issues as well as developing sustainable solutions for our modernized world as a whole. I think it is great that people from all over the world come together to help advance the cause of science. It is important that countries share information with each other and help each other. Science and cooperation benefits humanity. War destroys humanity. It is good to read about countries working together for mutual benefit. Geology is a field that impacts both China and the United States. We all want to find clean water, oil, and understand the Earths history and the causes of earthquakes. Predicting earthquakes and finding natural more resources, for example, would be a great accomplishment and benefit humanity in many ways and all over the world. Such a seemingly productive meeting … and so now is the time for you to organize a “Cities of The World” paper for the upcoming volume 2 (electronic) of the most recent papers in this important historic (since 1982) series of The Association of Environmental & Engineering Geologists! I encourage you to begin this effort and to contact Series Editor Joseph Krupansky, at jkrupansky@GFNET.com in order to begin the official preparation. This was very informative and intriguing. It is really amazing to know and see proof of China and America working together to promote and improve the geological issues within China. This article captures the beauty of the Chengdu lifestyle and the continuous geological growth of the city. Thanks for sharing such an informative and descriptive article with us. I never knew so much about China’s geological aspects. Usually, I would learn of China’s history, but never in such detail about the land. I enjoyed your article very much and I am fascinated that so much of China was hurt by the earthquake except Chengdu. This makes me want to visit China. Thanks again! This article was quite informative and intriguing. I knew a little of the geological aspects of China, but after reading your article, it makes me want to go to Chengdu and experience all that you described. The article was quite descriptive and educational. I will be sending this link to my Oceanography students for them to read and blog their input as well. Thank you for sharing this with us. Your extensive report on your findings at the meeting in China has provided some very interesting imagery as to what is happening in China today. I was able to picture what you were discussing in the report. This blog has given me more insight into what Geologists do and the issues that they discuss that have a greater impact on society than society may realize. Overall, it was a good read. It was very interesting to read about how GSC and GSA are coming together to inform and better the world. Its great that you were able to take part in such a amazing opportunity. It is a great mix between culture and science. America and China both being so advanced with technology and etc there is no doubt that great things aren’t being shared. I really enjoy your writing style is incredible and very enjoyable to read. Given that China has an incredible population it amazing that they can self support their energy resources. Like other readers, I also enjoyed your unique perspective on seeing this region of China in a geology context and in a cultural context. It’s truly amazing how big the world is. Thank you for sharing! P.S. I think you are incredible teacher: on paper such as these and in your classes! This article of the geological society of China and its architecture is a very interesting subject to learn about. Learning how the GSC and the GSA are working together to help make the world better to live in. Reading about 2 different societies working together is a relief from all the pandemonium I’ve watched on the news about Syria.This really shows how parts of the world are trying to moving forward and evolving intellectually while others in this world try to create terror. This article was very interesting to read how America and china are working together. I hope these two powerful countries will continue to work together to come up with better understandings of our earth. I like how in Chengdu the people ride scooters to get around the city. This helps the environment and i wish that many more cities in this world would be able to incorporate scooters as a way of transportation. Before reading this article, I did not know that there was a place in China called Chengdu. This article describes a great culture along with facts from a geologists point of view. It paints a vivid picture in the reader’s head. It was really nice to learn geological facts about the place. It is also great the two societies of America and China were able to set up a meeting to spread the information. After reading this article I learned new things happening in the geological society. It was enlightening to learn that two powerful countries were conducting a first joint scientific meeting on geology reminding us of the ongoing research to maintain a sustainable environment and ecological balance. This article is both educative and interesting . Geology is something people don’t realize is an important subject and to see both china and the United States are willing to work on things to improve chinas geology . It seems like you had an amazing time in chengdu . Would love to her more about his experience . This article on Geological Society of China and America was very illuminating and educative. I’ve learned a lot from this blog about how GSC want to advance cooperation in earth sciences between China and the US, also the maps were really helpful to better understand the article. I’m happy to hear that you have enjoyed yourself in Chengdu. Thank you for sharing your experience in china and geologic information. wow really your blog is so creative and it makes me thoughtful about the whole concept.it introduced me with a lot of interesting things that is unknown to me. I really enjoyed reading the article you have posted. It opened my mind to a lot of things that I was not aware of in Chengdu. I like how this article explained the surficial geology and the past history of Chengdu in such great detail. 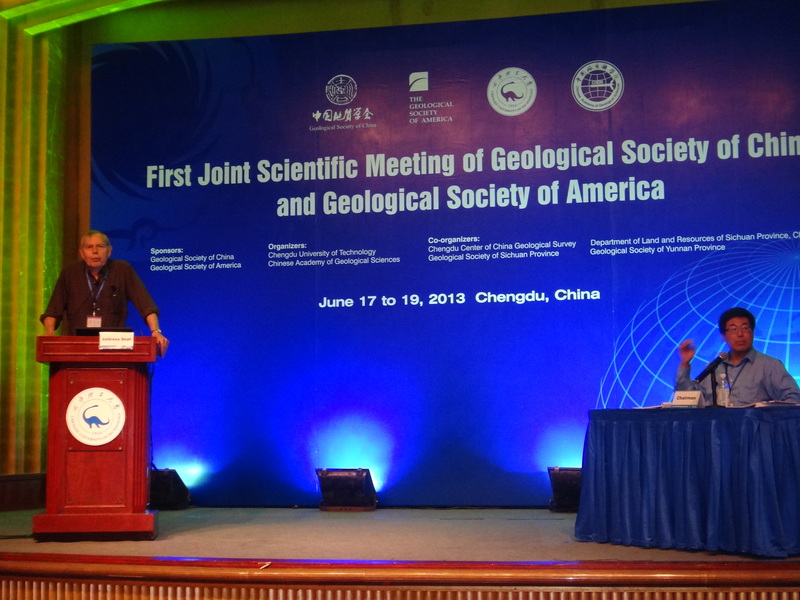 In addition to that, it is also great to see GSC & GSA to work together to improve Chinese geology. Truly insitful article Dr Khandaker you said I would love it and I did! I would love to see people waiting for traffic lights on scooters in New York ! It was nice reading your well written observations about your trip. Its good to see people coming together and seeing the importance of Geology. Thanks for sharing your experience. Dr. Khandaker, there’s quite a lot for consumption here. I especially enjoyed the effective way in which this piece shows sheds a light on a few cultural and social realities of China, along with the way in which these forces influences the use of geology. A meeting of this nature, with all the different elements it presented, must have been quite the whirlwind for yourself Dr. This is very interesting! 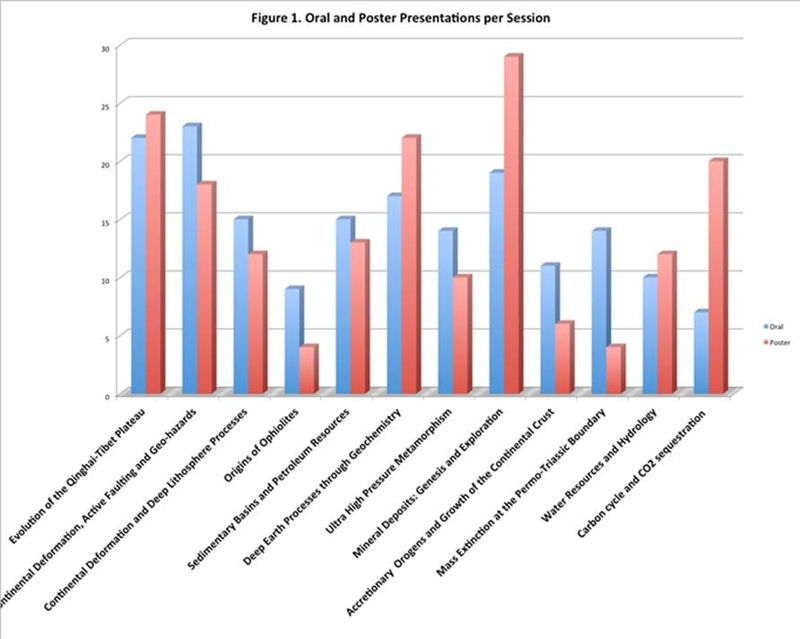 Referring to figure 1 (the poster presentations graph), I wasn’t aware of many of the issues and concerns the geological community has in China. I appreciate your recollection of this meeting, as I also did not know about the very beneficial and environmental friendly lifestyle the people of Chengdu live. I hope these meetings bringing GSA and GSC together continue, so that both communities can share these ideas and methods to prosper in the earth sciences. This is an excellent article about the Roof of the World meeting in Chengdu, China. I truly enjoyed learning about the geologic history, especially the detail provided about the stratigraphic units in the surficial geologic makeup of Chengdu. Also, I enjoyed transition you made to the aspects modern life in Chengdu. I look forward to reading about more GSA conferences. This blog provides information on Chengdu and on the meeting between China and America. It shows how both America and china come together geologically. It provides all the necessary background and necessary information on Chengdu. Dear. Dr. Khandaker. I’m so glad that I have you as my professor who is part of this organization, who works really hard to solve the geo-problems that we are facing today’s world. I’m also glad to know lots of things about Chengdu because this my first time I heard this place name which is located in China. 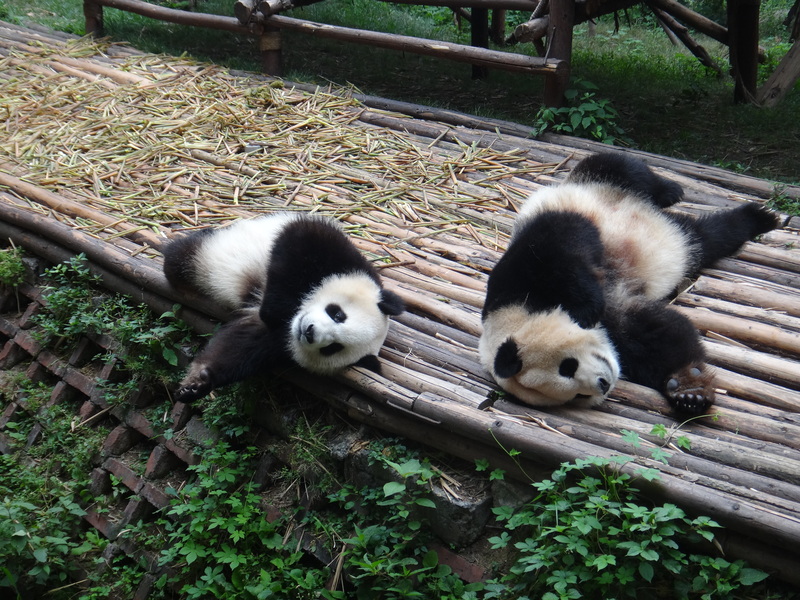 I wish one day I’m going to go to Chengdu to visite the place. Excellent recap. It was great how people from several parts of the world were able to attend this meeting and present their work. I believe this will cultivate a broader perspective when looking at social issues such as rapid urbanization and its geological effects. I’m learning more about the geological society of the word. This was a very informative blog. I was able to obtain a lot of interesting information pertaining to the meeting that took place in China between GSA and GSC. The detailed descriptions of Chengdu were fantastic. I did not know that Chengdu was named the “Best Tourism City of China.” This meeting was intended to promote cooperation in advancing the studies of earth sciences. Dr. Naz, I find your article to be very interesting and informative. Thank you for sharing your experience with us. It is good to see the GSA & GSC working together to promote geology. I really enjoyed reading this well written report on your trip to china, it seems very interesting and both of these societies have joined to make a better environment in both countries of the world. I liked how you were very specific describing the city of Chengdu and how it has become “The Best Tourism Of China” i enjoyed reading your article Thank you. Very insightful and informative blog. I’ve learn a lot about the city of Chengdu, especially about its geology, society, economy, infrastructure and culture. Glad that the first joint scientific meeting between the GSC and GSA was a successful one. This will surely prove to be beneficial for the future in geosciences. Thank you for sharing your experience of being there. This was well written. Like Sambhavi said, readers feel like they were there. I like that you also included a map of Chengdu. It was pretty interesting but with all due respect, I believe china should focus less on minerals and urbanization and more on clean air. They should focus more on water resources and hydrology. China is a highly populated area in the world and with more urbanization they number is sure to go up rather than down, and with their air pollution problem bad as it is already, they need to think of other sources of energy that are much cleaner. Great observations of the vibrant city, Chengdu. I wonder if it’s the unique weather, food, and geographic location that make it a fun place to go to. Also as a domain expert in Geology, you may have been trained to be sensitive to such information as land, inhabitants, resources – this is a fun blog to read. 🙂 Look forward to reading more about your future trips. This article was really insightful, seems like you had a good time in Sichuan province. This piece on the event Joining of the GSA & GSC was very well written. Thank you for sharing your knowledge on the ever expanding science of geology and some of the great facts about the City of Chengdu. Thank you again for sharing your experience on this topic, I really enjoyed reading your report. Very well written and thoughtful piece. Your personal and professional observations are very much appreciated by your fellow Board members and all of us at the City University of New York’s Asian American/Asian Research Institute. I’m glad to hear that you enjoyed yourself in Chengdu! I have had the pleasure of visiting the mountain ranges of Yunnan many years before, but to read about the origins and the composition of some of China’s most prominent natural wonders was enlightening. I am delighted to hear that you were able to witness a meeting between the GSA and GSC, and hope that continuing such meetings will yield the most beneficial results for both the United States and China, as they both have come a long way. I also hope that you may travel to many other international meetings, and blog about them as well! I’m sorry that I couldn’t attend the meeting. It seems that I missed an outstanding meeting over in China. My only experience in China was when I gave a presentation at the American Applied Sciences Research Institute Conference in Wuhan in 2011. It is a good sign that the Chinese are more active in researching their own geology and I look forward to seeing more publications featuring their geology. I am glad that you enjoyed your visit to China and thank you for your nice words about Chengdu! I don’t know much about geology, but everybody can see the importance of geology for a growing economy: the environment issues and landscape protection are the concerns of global ecology. Your work will facilitate the geological studies in China. Wow, I didn’t know Chengdu was named “Best Tourism City of China.” Most people would consider cities like Beijing, Hong Kong, Taiwan, and Shanghai for visits. Thank you for sharing such an interesting article about Chengdu. If I do go to China for visits, I would mark Chengdu as one of the sites I should go to. Thanks a lot for sharing the experience you had on the meeting of both amazing societies, USA and China. It is a great news to hear that these societies joined. This union will bring great benefits for both countries in aspects of science. I enjoyed reading the article, especially the description of the city that you have done in terms of culture and geology. Thank you for your informative article about your experiences in Chengdu. It was great to show and explain the geological developments going on in the east. It has come a long way since 1922 and by your explanations it seems that the assimilation of the smaller chinese geology societies will prove beneficial to the development of geology as a whole. Thank you for sharing the photos and stories of the city. One day when I visit, I will be prepared for the humidity and spicy food! What an amazing job you’ve done！The whole summary is so vivid as if they all happened yesterday,and it is so impressed that you know so much about ChengDu,you’ve depict her thoroughly with great efforts,it’s an honour for this city and the residents here,thank you. So kind of you to say that. Indeed, it was my pleasure to highlight Chengdu in terms of geology, people, culture, food and infrastructure. A great city with lots of promises for the future. Nice summary Naz! It would be nice to have a blog for each of the themed International Section sponsored meetings. It looks like a great city too. Did a great job, especially in Chengdu’s geological background and the local setting and lives. Thanks for your special observation, collection and summary. Nice write. It’s amazing that you know the geology of Chengdu and adjacent areas too much. I am looking forward to seeing you again in China. China is huge, with a lot of interesting geological outcrop, which are far from good understanding. 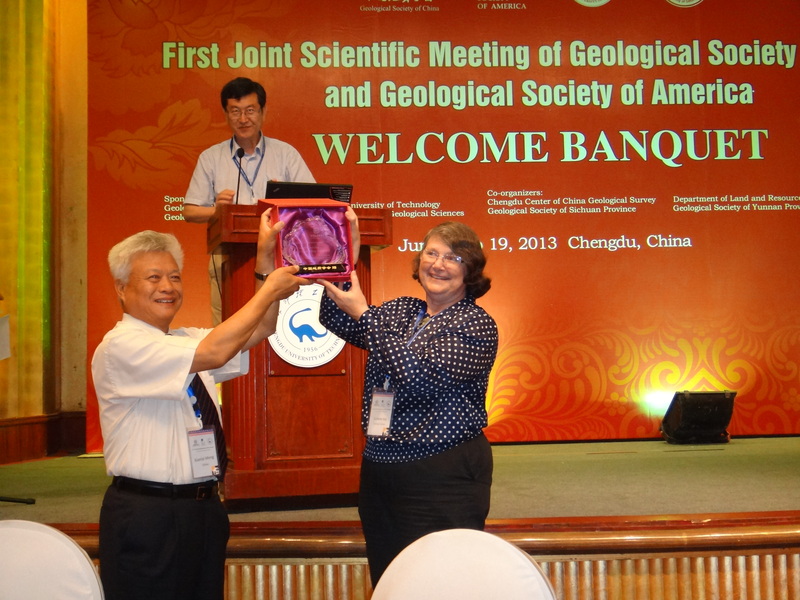 I think a good interchange between GSA and GSC is good for Chinese Geology. With your blog, I seem to have finished a trip to Chengdu and gone through all the sections of the conference. Great work, full of kindness and friendship. I appreciate all your effort devoted to science community and China. You are really a learned scholar and good writer, knowing so much about China further beyond my imagination. Your candid comments are very much appreciated. I tried my best to portray China, particularly Chengdu and keep you abreast on what’s happening with respect to geosciences, culture, and development. Thank you. This is a great summary of what appears to be a very productive trip. I am very impressed with the detail and completeness of the report. Reading it give a very informative picture of what was happening. I got the feeling of being back in China myself. Kudos to you Naz! You have done us proud! Wow this is truly impressive. It’s amazing to see what a group of people with common interests can accomplish when they work together. Thanks to this blog I’ve learned lots of new interesting facts. Rock on Dr.Khan! Well done Dr. Khandaker!!! I loved reading this log, it is quite informative. I had no idea the amount of behind the scene work and dedication that went into arranging, organizing and planning this joint GSA and GSC meeting. It is impressive that there was such a good show of support, as indicated by the wide range of research. Congratulations to you on a work well done. I do hope this collaboration is the first of many for the GSA, not only in China but other countries as well. I can imagine the jet lag alone that you and the other GSA representatives had when you returned to the states lol. This article was very interesting. It’s amazing how both geological societies came together to look into it. I really like the figures because visuals help the explanation. I like the educational value of the blog. It has taught me some new facts in geology. Hello Naz: Nicely done. Very interesting reading. I would have gone to this meeting if geology in my specialty had been a part of the program. Not having been there, it is great to have this comprehensive report. That was an outstanding blog. I commend Naz for informing us as to the several new developments in the expanding field of geology. Thanks a lot for sharing such a pleasant experience of Geosciences event prepared by the GSA and GSC jointly. I am very happy to see Dr. Jack Hess contributing a lot towards the success of this joint meeting. I know him for the first time in the Colloquium of African Geology (CAG24) meeting held in Addis Ababa, Ethiopia in Jan., 2013. He made me to be a member of the GSA during this event. Regarding your blog Figure 5 is not clear to me. Reading your article was quiet pleasant, the way you described each scenary of each place makes me want to travel and visit Chengdu. I’m glad that a lot of people were involved with each topic that was brought up, its great that this collaboration was a success because of two different groups sharing a common interest. Thank you for your nice feedback. Yes I had the great opportunity to blend geology and culture together through this meeting participation and highlight the role of geology in dealing with societal issues. This article was very interesting. It’s amazing how both geological societies came together to look into it.. Reading it give a very informative picture of what was happening.